ULAANBAATAR, MONGOLIA--(Marketwired - Nov. 18, 2015) - Khot Infrastructure Holdings, Ltd. (CSE:KOT) ("Khot Infrastructure") is pleased to announce that it has entered into a Consortium Agreement with Shandong Electric Power Construction Corporation III ("SEPCOIII"), a Chinese State-Owned Enterprise. SEPCOIII, a subsidiary of PowerChina, is a world leading Engineering, Procurement, and Construction ("EPC") company. James Passin, Chairman of Khot Infrastructure, signed on behalf of Khot Infrastructure; Mike Chen, President of SEPCOIII Investment, signed on behalf of SEPCOIII; and Ch. Orgilbold, CEO of Ashid Munkhiin Zam LLC ("AMZ"). Khot Infrastructure's Mongolian subsidiary, signed on behalf of AMZ. The terms of the Consortium Agreement allow for a 75/25 percent cost sharing and revenue sharing model between SEPCOIII and Ashid Munkhiin Zam LLC ("AMZ") on road concession projects granted by the Mongolia government. James Passin stated, "We are excited to form a Consortium with SEPCOIII, an award winning, internationally recognized leading EPC. With the backing of SEPCOIII, we will move quickly to secure significant, profitable projects." Coordinating efforts with China's larger New Silk Road Economic Belt project, Mongolia will participate in the international Economic Corridor linking resources and markets between Russia, China and Mongolia, as well as other Central Asian countries. November 19 (Proactive Investors) Major investors in Xanadu Mines (ASX:XAM) have committed to extend their support for the company's Kharmagtai copper project in Mongolia by participating in an expansion of a recent fundraising drive. Noble Group and major shareholder Asia Capital Advisors (ACA) will increase their investment in Xanadu as part of an expansion of a share placement from A$8 million to $8.3 million. Noble is expected to subscribe for about 1.8 million additional Xanadu shares at a price of $0.125 per share. ACA has also committed to participate and will remain a 27.2% shareholder in the company. Xanadu shares last closed at $0.125, which represents about a 56% increase for the stock over the past two months. The funds raised from the placement will be used to reduce the Kharmagtai deferred acquisition consideration and advance Xanadu's winter exploration program at the project. In conjunction with the placement, Xanadu is pursuing $2 million of additional funding via a share purchase plan at the same offer price. The plan opens today and will remain open until December 4. This latest funding drive follows more than $15 million in capital raisings since the company's 2014 annual general meeting and builds on a cash position of $2.5 million as of the end of September. A comprehensive work program, comprising about 15,000 metres of diamond and reverse circulation drilling is currently being finalised to expand the limits and grade of the current deposits not included in the current resource inventory. Earlier this year, Xanadu defined a maiden resource at Kharmagtai of 203 million tonnes at 0.34 per cent copper and 0.33 grams per tonne gold for a contained metal content of 1,500 million pounds copper and 2.2 million ounces of gold. The program will also follow up recent trenching success at Kharmagtai's Tsagaan Sudal area. Importantly, the surface mineralisation intersected in the Tsagaan Sudal trenching was consistent with or better than this resource estimate, providing further confidence in the geological interpretation, mineralisation controls and resource model. Broad intersections from the trenching work confirmed 304 metres at 0.40% copper and 0.23g/t gold (0.55 CuEq) and 280 metres at 0.36% copper and 0.10g/t gold (0.43 CuEq). Based on visual observations, the stockwork mineralisation in all trenches contain visible chalcopyrite and only weak oxidation of the copper sulphides, as has been observed in previous trenching and drilling at Kharmagtai. Kharmagtai drilling in September returned 484 metres grading 0.57% copper and 0.32 grams per tonne gold from 186 metres, including 158.4 metres grading 0.8% copper and 0.24g/t gold from 342 metres. The South Gobi Province is the fourth most endowed copper province globally. It is a highly mineralised and vastly underexplored mineral belts known to host large deposits. Adding further to the area is proximity to infrastructure and the North Asia market. Mongolia has attracted more foreign investment with a more liberalised mining policy in recent months. This was demonstrated earlier this year with a breakthrough in Rio Tinto-government negotiations over the massive Oyu Tolgoi copper-gold project and a parliament decision to adopt a rail gauge compatible with China. Announcement of project finance for Oyu Togloi is expected to bring confidence back to investors in Mongolia. Increased support from key investors Noble and ACA represents an important endorsement of Kharmagtai, which is set to expand an already impressive inventory. The increased size of the funding drive will further reinforce plans to reduce the Kharmagtai deferred acquisition consideration and drill deposits which could add significantly to project resources. ACA and Noble Resources International have combined to invest more than A$15 million in Xanadu since the company's annual general meeting last year. This support has coincided with improved confidence at Kharmagtai, where tourmaline breccia mineralisation is increasingly indicating similarities to some of the world's largest, most endowed porphyry copper deposits. Xanadu has enjoyed positive share price movement as encouraging drilling results have been published over recent weeks. Potential catalysts for further increases in the company's valuation are evident in the upcoming drilling program as well as the finalisation of a new geological framework and follow-up of detailed magnetic studies. HALIFAX, NOVA SCOTIA--(Marketwired - Nov. 16, 2015) - Erdene Resource Development Corp. (TSX:ERD) ("Erdene" or "Company"), is pleased to provide an update on the Company's principle metals projects in southwest Mongolia in conjunction with its September 30, 2015 third quarter financial results. November 16 (FinancialMagazin) Robert Polak increased its stake in Turquoise Hill Res Ltd (NYSE:TRQ) by 123.78% based on its latest Q3 2015 regulatory filing with the SEC. Anchor Bolt Capital Lp bought 8.45M shares as the company's stock declined 32.00% while stock markets rallied. The hedge fund run by Robert Polak held 15.27 million shares of the precious metals company at the end of Q3, valued at $38.95M, up from 6.82M at the end of the previous reported quarter. Anchor Bolt Capital Lp who had been investing in Turquoise Hill Res Ltd since many months, is probably bullish the $5.45B market cap company. The stock decreased 1.82% or $0.05 on November 13, hitting $2.7. Turquoise Hill Resources Ltd (NYSE:TRQ) has declined 31.30% since April 14, 2015 and is downtrending. It has underperformed by 27.82% the S&P500. Anchor Bolt Capital Lp, which manages about $849.21 million and $3.01 billion US Long portfolio, decreased its stake in Noble Energy Inc (NYSE:NBL) by 888,752 shares to 1.30 million shares, valued at $39.11 million in Q3, according to the filing. It also reduced its holding in Eog Res Inc (NYSE:EOG) by 149,611 shares in the quarter, leaving it with 333,991 shares, and cut its stake in General Dynamics Corp (NYSE:GD). Robert Polak manages Anchor Bolt Capital out of Chicago, IL. Anchor Bolt Capital was founded in 2012. Robert Polak previously worked at Copper Arch Capital, NWQ Investment Management, Salomon Brothers and with Ken Griffin at Citadel. He was manager of Citadel's global industrials investments. Anchor Bolt Capital Lp is a Illinois-based hedge fund that was founded by Robert Polak. It had more than $849.21 million assets under management in April, 2014. Taken from Anchor Bolt Capital latest Adv, the fund reported to have 10 full and part-time employees. Among which 6 performing investment advisory and research functions. The hedge fund had between 1-10 clients. VANCOUVER, Nov. 20, 2015 /CNW/ - Kincora Copper Limited (TSX.V: KCC) ("Kincora" or the "Company"). Further to its news releases of October 22, 2015 and November 10, 2015 the Company announces that it has received the acceptance of the TSX Venture Exchange to the issuance of the $2,500,000 convertible note (the "Note") to Origo Partners plc ("Origo") (the terms of which are detailed in the October 22, 2015 release) and to the issuance of 4,350,000 common shares of the Company at a deemed price of$0.05 per share (the "Interest Shares") to Origo in settlement of outstanding interest due to Origo (as detailed in the November 10, 2015 release). Both the Note and the Interest Shares are subject to a hold period expiring March 19, 2016. VANCOUVER, BRITISH COLUMBIA--(Marketwired - Nov. 16, 2015) - Entrée Gold Inc. (TSX:ETG)(NYSE MKT:EGI)(FRANKFURT:EKA) ("Entrée" or the "Company") wishes to announce that Greg Crowe is departing Entrée to pursue other opportunities. With the pending departure of Greg Crowe, the Board undertook a search for a new interim CEO and is pleased to announce the appointment of Stephen Scott as the interim Chief Executive Officer of the Company effective November 16, 2015. Mr. Crowe will work with the new CEO to affect a seamless transition. The Company thanks Mr. Crowe for his many contributions throughout his tenure as CEO. 3) Options to grow through the acquisition of cash generating assets into the business. The BNU coking coal mine operating asset in the South Gobi region continues with the implementation of the Life of Mine Plan (LOMP). The operation is continuing to deliver a superior metallurgical coal product to end users in China. As the volumes have increased on a month to month basis the operation has encountered variances to plan in the third party washing capacity and capability. The volume increases have also placed stress on the third party road transport capabilities that has led to variances to plan over the past month. Actions are constantly being implemented to deliver on the development of a 'pit to end user' supply chain. As per the strategic direction of the Company, a number of cash producing operating assets have been identified as potential additions to the Company's portfolio to support the BNU coking coal mine in Mongolia. These opportunities will be carefully considered by management and market announcements will be made where appropriate. November 18 -- Guildford Coal Limited (Guildford or the Company) (ASX: GUF) is pleased to advise that following overwhelming shareholder approval at an EGM on 30 October 2015, the Company has adopted a new brand name: TerraCom Limited (TerraCom or the Company) (ASX: TER). Effective 19 November 2015, Guildford securities will trade in the name of TerraCom Limited, with the new ASX code: TER. The Company's new web address is www.terracomresources.com. This will also commence on 19 November 2015. The transition to a new brand will assist TerraCom in delivering value to shareholders as it implements a growth strategy. It heralds an exciting new chapter in the development of a multi-jurisdictional resources Company. November 16 -- The board of directors (the "Board") of Mongolia Energy Corporation Limited (the "Company") announces that a meeting of the Board of the Company will be held on Friday, 27 November 2015 for the purpose of, among others, approving the announcement of the interim results of the Company and its subsidiaries for the six months ended 30 September 2015 and transacting any other business(es), if any. November 15 (Mongolian Investment Banking Group) Sure, everyone talks about how the Mongolian economy is suffering without foreign direct investment. The continued weakening of commodities prices, lack of FDI, and seasonal challenges, have all contributed to a depressed feeling on the streets of Ulaanbaatar. This week, we're going to look at a few macro-economic indicators and discuss the outlook and potential opportunities that exist in Mongolia right now. To start, second quarter GDP growth landed at only 3% yoy. In the first quarter, it was 4.4%, adding to an ongoing trend of decreasing performance. Domestic consumption has also shrunk significantly during this period. With the country importing $4.28 billion USD during the first 9 months of 2014 compared to $2.99 billion USD in the same period of 2015, nearly a 43% drop. The export numbers are down as well: from $4.22 billion in first 9 months of 2014 to $3.67 billion for the same period of 2015. Not surprisingly, this drop can be primarily attributed to the ongoing fall in commodities prices… don't forget, the export of mineral products accounts for approximately 78% of total exports. The GoM's current fiscal loss is 900 billion MNT (approx. 450 million USD). This is the highest that it's been in the past 3 years. Obviously, the mining sector which contributes about 38% of the fiscal budget (according to the Ministry of Mining) is the main cause for the current fiscal loss. Sounds gloomy, that's because it is. The Government is taking measures… primarily austerity, as we've discussed in our previous weekly notes. Falling inflation, down from 8.5% to 4.9% yoy at the end of September, is having a positive effect on lower income Mongolians. The result: prices of domestically produced food staples, such as meat have decreased significantly. However, it's the ever-increasing MNT/USD rate that continues to cause serious problems for Mongolian households, with imports representing 90% of consumption. It means we have a long road in front of us before the market takes a turn for the better. It means optimism may be a bit early. And it means that most people are wrong when it comes to Mongolia… probably because they don't have a team on the ground like us. MIBG's analysts actively participate in Bloomberg's analyst surveys and for some reason our outlooks always fall on the bearish end of the spectrum. We believe Mongolia is set to experience further economic contractions over the coming quarters. Why? Well, in addition to all of the reasons outline above we're also weary of the tapering off that is about to take place in the Mongol Bank's easy money policy. But that's not all. Our outlook for the construction and real estate sectors has reached RFTH, "run for the hills." And, we also expect the banking and financial services industry to experience turbulent times over the next 12 – 18 months… beyond that is anyone's guess. Now you're probably thinking, "I thought they were going to talk about opportunities," well we are. But in order to talk about the opportunities we're investing in we also need to discuss what we're avoiding. For those who have been following us regularly this should come as no surprise, we're not shy about our investment thesis or the kind of value and risk that we're hungry for. When it comes to Mongolia we see one story that makes sense… for now. It's advanced stage mineral exploration. There are a handful of companies, both private and public that are drilling, turning out world class results, operating below the average cost of exploration globally, and trading below their peers. In our opinion, this is and will continue to be the money-maker in Mongolia for the next few years. Simple, do your research and start identifying companies that present valuable propositions. We cover a handful of these companies in our weekly notes… such as Erdene Resource Development Corp., who received updated coverage from MIBG this month. Then, start trading on the open market with your broker. You don't have a brokerage account? That's an easy fix. You can email MIBG's Head of Sales & Trading and enquire about opening an account today! Whether you're sitting in Ulaanbaatar or some tropical paradise overseas, MIBG can help you access companies listed on foreign exchanges and on the Mongolian Stock Exchange. Just send an email to altanbayar@mibg.mn and ask for information on opening an account. [ET Net News Agency, 18 November 2015] National United Resources Holding (NUR Holdings) (00254) said it agreed to place 6% coupon bonds due 2017/2018 in an aggregate principal amount of up to HK$300 million. The estimated net proceeds of about HK$297 million will be used as to about 36% for settlement of outstanding debts and related interests; about 50% for investment activities when such investment opportunities arise; and about 14% as general working capital to strengthen the company's financial position. (3) Ms. Cao Xinyi has been appointed as the chief executive officer of the Company with effect from 16 November 2015. November 16 (MSE) Mongolian Stock Exchange organized 4 securities trading sessions and made transaction of MNT10,031,494,943.00 with daily average transaction of MNT2,507,873,735.75 between 09 November 2015 and 13 November 2015. 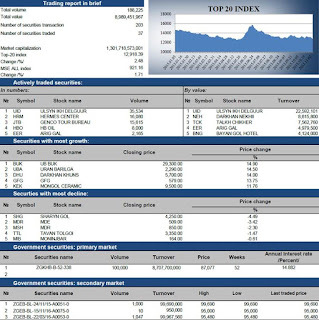 106,071.00 shares of 24 joint stock companies worth of MNT31,494,943.00 were traded. 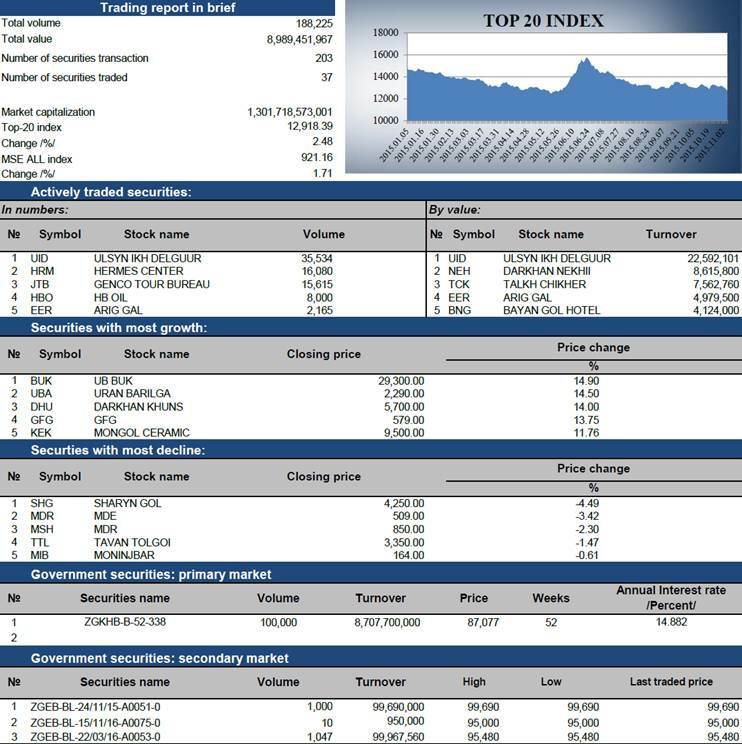 As of November 2015, market capitalization was MNT1,284,810,140,361.00 which indicated decreased of 0.45%, and MSE ALL index reached 905.67 units which indicated decreased of 0.83% from the previous week. November 17 (MSE) On 17 November 2015, the bond orders of 52 weeks Government bonds with 14.882% annual interest, placed on order book, and Ministry of Finance supplied 100,000 or MNT10.0 billion out of total order 202,312 pieces or MNT20.2 billion. November 18 (MSE) Buy order of 12 weeks Government bonds with 13.80% annual coupon rate and 156 weeks Government bonds with 15.750% annual coupon rate starts from 18 November 2015 until 24 November 2015 through brokerage companies. Click here to see detailed information of short-term /3 months/ Government retail bonds. Click here to see detailed information of long-term /3 year/ Government retail bonds. November 19 (MSE) According to the Article No. : 6.1.1 of Legal Code of Financial Regulatory Commission, the Article No. : 20.1 of "Securities Listing Regulation" of FRC, the legal name of "KHAABZ" JSC changed to the "Hunnu Management" JSC on FRC's listing. MSE's listing amendments will be taken according to the "Listing Regulation of MSE". November 19 (BoM) On the Foreign Exchange Auction held on November 19th, 2015 the BoM has received bid offers of USD 12.8 million in a rate between MNT 1990.30-1993.30, bid offers of CNY 23.0 million in a rate between MNT 311.02-312.05 and selling bid offers of CNY 20.0 million in a rate between 313.01-313.05 from local commercial banks respectively. The BoM sold USD 4.4 million in a rate of MNT 1992.82. On October 19th, 2015, The BoM has received MNT Swap agreement buying bid offer equivalent to USD 9.19 million and USD Swap agreement selling offer equivalent to USD 10.0 million from local commercial banks and the BoM has accepted the offers. November 18 (BoM) Auction for 3 years maturity Government Bond was announced at face value of 10 billion MNT and each unit was worth 1 million MNT. The Government bond was not sold the due to absence of both competitive and noncompetitive bids. November 18 (BoM) Auction for 12 weeks maturity Government Treasury bill was announced at face value of 1.0 billion MNT. Face value of 10.0 billion /out of 22.5 billion bid/ Government Treasury bill was sold at discounted price and with weighted average yield of 13.800%. As of Oct 2015 the total cumulative trade turnover decreased by 21.9% (USD 1,990.0 millions) from that of the previous year and reached USD 7,090.0 millions. The decrease in the trade turnover was mainly due to the decrease in imports by USD 1,311.0 millions. The structure of the trade flows with the neighboring trade partners is as following: (i) trade with PRC: 62.3% or USD 4,420.2 millions and (ii) trade with Russia: 12.7% or USD 901.1 millions. The trade volume between Mongolia and China decreased by 20.2% and the trade volume between Mongolia while Russia decreased by 34.4%. As of Oct 2015, the cumulative trade balance improved by USD 632.0 millions from that of the previous year and reached USD 763.4 millions. During the reporting period even though the total exports decreased by 14.7% from that of the previous year, imports decreased by 29.3% from that of the previous year, thus the trade balance improved by USD 632.0 millions. The three-month moving average value of the difference between annual growth rates of exports and imports started to decline since the beginning of 2015. The high export growth rate during 2014 was due to the exports of copper concentrate and it started to stabilize. As of Oct 2015, the trade balance of paid trade flows reached USD 1,007.6 millions. During the reporting period, paid imports de-creased by 31.6%, and paid exports decreased by 15.4% from that of previous year. As of Oct 2015, terms of trade index (2012 base year) decreased by 9.5% from that of the previous year and reached 1.408. This decrease in the terms of trade is mainly attributed to the de-crease in export price of copper concentrate, iron ore and crude oil. The share of mineral exports in total exports maintained at the close level as the previous year. Exports of coal, copper concentrate, iron ore and concentrate and crude oil have a weight of nearly 77% of total exports and 84% of mining exports. In addition, these 4 products' share in the mining exports de-creased by 3.0 points from that of the previous year, share in the total exports decreased by 4.0 points. Mongolian export decreased by 14.7% from that of the previous year, which was mainly affected by decrease in commodity prices. Exports of non-monetary gold increased by 10%, which accounted for 1% in growth of mining export. On the other hand, coking coal, iron ore and crude oil export decreased by nearly 32%, 49% and 41% respectively, which accounted for 15% decrease in the growth of mining export. As of Oct 2015, Mongolian export decreased by 679.0 million USD from that of the previous year. It is affected by the increase of export commodities' quantities (USD 156.5 millions) and decrease in export commodities' prices (USD 835.5 millions) . Because of the increase in quantity of crude oil, nonmonetary gold and copper concentrate export, mining export increased by 345 millions USD. On the other hand, because of decrease in prices of mineral exports, mining export declined by 750 million USD. Cashmere, cashmere products' export decreased by 45 million USD, while other exports stayed at the same level. As of Oct 30 2015, gold price reached 1,142.1 USD, decreased by 2.6% from that of the previous year and decreased by 2.4% from that of the last month. As of Oct 30 2015, copper and iron ore prices reached 5,129.5 USD and 50.0 USD. Copper price decreased by 0.9% from that of previous month and decreased by 24.1% from that of previous year. Iron ore price decreased by 10.7% from that of previous month and decreased by 36.7% from that of previous year. As of Oct 2015, 29% of total imports were consumer goods, 38% were capital goods and 19% were fuels. Share of the capital goods in total imports decreased by 4% from that of the previous year, while the share of consumer goods import increased by 4%. Mongolian imports decreased by 29.3% from that of the previous year. Main contributors of this decrease were capital goods decrease, which equals to 14% of the total decrease and fuel imports which equals to 8% of the total decrease. Capital goods and petroleum products imports decreased by 34% (641 millions USD) and 39% (376 millions USD) respectively. Thus total import decreased from that of the previous year. Main contributors of decrease in consumer goods import were both in durables and non-durables. Passenger cars import decreased by 29% (88 millions USD) and foods import decreased by 17% (71 millions USD). Capital goods import decreased by 34% (641 millions USD) which was mainly contributed by 36% decrease in machinery, equipment and supplies (344 million USD). In addition, import of construction materials decreased by 38% (268 million USD) from that of previous year. Intermediate goods and industrial materials import decreased by 14% (73 millions USD). Fuels import decreased by 39% (376 millions USD). The border price of oil has been decreasing since the end of 2013 (Figure 8). In parallel with global oil market price, it declined sharply during last half year. The growth of consumer goods import, calculated by 3 month moving average method, is constantly declining. /Figure 7/. Even though, the import growth of non-durable consumer goods was relatively stable, it started to decline by bigger phase in last 6 months. HONG KONG, November 20 (Nikkei Asian Review) -- Once a favorite of frontier-market investors, the outlook for Mongolia's mineral-rich economy is deteriorating as the commodity supercycle turns negative and China, practically the sole buyer of its exports, slows. Foreign investment has evaporated and international observers, who were among Mongolia's early boosters, are cutting their forecasts and raising concerns over the sustainability of the country's external debt. Mongolia is due to make big repayments on hundreds of millions of dollars in debt, starting in 2017. Naidansuren Zoljargal, the governor of the Bank of Mongolia, says that the investors and ratings agencies might be mistaken, and that there is "no risk of default whatsoever." "Rating agencies don't see what we achieved in terms of reducing the current account deficit and inflation," Zoljargal said on the sidelines of the Mongolia Projects and Investment Summit, held in Hong Kong on Nov. 16 and 17. "But if we take that into account, among all the resource-rich emerging markets, Mongolia still looks pretty OK."
Credit rating agency Standard & Poor's cut Mongolia's long-term sovereign rating to B from B+ on Nov. 3, saying that "lower economic growth will increase vulnerabilities arising from its high twin deficits," in reference to the country's fiscal and external imbalances. A few days later, the World Bank slashed this year's growth forecast for Mongolia to 2.3% from 3.3% and to 0.8% for 2016, as "mining production is projected to decline in 2016-17, with lower mineral concentration in ores produced by the Oyu Tolgoi mine and the weak global commodity market conditions," according to the bank's latest country economic update published earlier in November. Mongolia's economy grew 7.8% in 2014. The central bank chief finds the numbers unpersuasive. "Today we are far more competitive and resilient in terms of balance of payments and inflation risks, which is part of the adjustment we achieved, although it seems that rating agencies don't appreciate it that much," Zoljargal said. Mongolia's current account deficit will fall to 5.4% of gross domestic product in 2015 from 27.4% in 2013, according to World Bank estimates. This was in part due to the Mongolian currency, the tugrik, falling more than 21% against the dollar since the end of 2013 and lower demand for imports when Oyu Tolgoi came online and boosted exports of gold and copper. At the same time, weaker domestic demand eased inflationary pressures, with annual consumer price inflation falling to 3.4% in October from 12.2% at the end of 2013. "Under these circumstances, we have a lot of options to play around [with]," Zoljargal said, referring to the upcoming repayments on more than $1 billion in debt in 2017 and hundreds of millions of dollars more of loans through 2022. "Refinancing is one of the options, but we are far away from a default. In fact, with the actual current account and inflation figures, our risks are very manageable." Mongolia hit the headlines in 2012, when it made a stellar debut in the international bond markets by placing two "Chinggis" bonds that raised a total of $1.5 billion on very favorable terms. 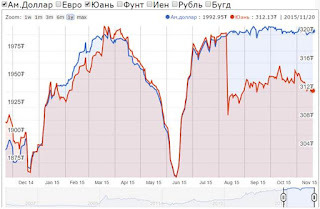 However, as the country's economic fortunes turned sour, the market adjusted and Mongolian bonds are now taking a beating. The yield on the country's 10-year bond rose as high as 9.4% in August, from an original yield of 5.125%. "It is a different world now. It's not like in 2012, with the super commodity cycle and cheap money coming out of the U.S.," Zoljargal said. "We are facing the exact opposite cycle, and if we went to the bond market today we would likely pay yields of around 7%." Foreign direct investment has dried up, and the country's increasing reliance on external funding is raising concerns. External debt financing reached $1.3 billion in the first nine months of the year alone, pushing Mongolia's total external debt to 69.3% of GDP in 2015, from 39% in 2012, according to the World Bank. The government's fiscal deficit is forecast at 8.6% of GDP in 2015, including quasi-fiscal spending by the state-owned Development Bank of Mongolia, down only slightly from 10.8% in 2014, the World Bank says. Zoljargal is pushing for closer coordination of the country's fiscal and monetary policies to create macroeconomic stability. He addressed the State Great Hural, Mongolia's parliament, on the subject in October. "I never agreed with those politicians [who] say we can afford a fiscal deficit of one or two percentage points," he said at the time. "The fiscal deficit should be zero, that's the perfect fiscal policy." But in the current situation, observers say rolling over Mongolia's debt may be challenging. "With that fiscal deficit, current external debt and weakening prices, it will be extremely difficult to do refinancing. And even if it [is] possible, it will be extremely costly," said Ulambayar Bayansan, senior adviser at investment company Melbury Capital. With refinancing in the market tricky, the government may have only two options as 2017 debt repayments approach. Prime Minister Chimed Saikhanbileg raised the possibility of reaching a standby lending agreement with the International Monetary Fund earlier this year that could amount to an IMF-led bailout of the country. At the same time, Mongolia is strengthening its cooperation with China, which has already expanded its currency swap line with the Bank of Mongolia to 15 billion yuan ($2.35 billion) from 10 billion yuan. This lifeline is one of the country's few remaining sources of foreign currency, along with $1 billion loan for infrastructure development from the Export-Import Bank of China. The authorities and investors have a lingering hope that a multibillion dollar expansion of the Oyu Tolgoi mine will reignite the boom that first put the country on the investment map a few years ago. After months of negotiations, the government and mining powerhouse Rio Tinto, which runs the project through its subsidiary Turquoise Hill Resources, reached a final agreement on the expansion in May. The company is in the process of closing a deal on a project finance package of over $4 billion with a group of international banks. Once that comes through, the board is expected to issue a final go-ahead in the first half of 2016. Rio Tinto expects to spend as much as $9 billion on the project, a staggering figure for a $12 billion economy. Meanwhile, the $4 billion development of Tavan Tolgoi, the country's largest coal mine, by a consortium comprising China's Shenhua Energy, Japan's Sumitomo Corp. and Mongolia's Energy Resources awaits parliamentary approval. Both projects have been in the pipeline for years and finally appear close to getting off the ground. But Mongolia's political landscape remains unpredictable. With a general election slated for next year, investors will be waiting for news that the Oyu Tolgoi and Tavan Tolgoi mines are ready to write the second chapter of the country's economic miracle. HONG KONG, Nov 20 (IFR) - Mongolian offshore bonds continued to recover on Friday after incurring a 2-point loss this week. Trade and Development Bank's January 2017s jumped a point to 98.485. The sovereign's US$1bn 5.125% 2022s, which dropped to a one month-low on Monday, have since risen a point to 82 cents on the dollar. November 20 (World Economics) The World Economics Headline Sales Managers' Index (SMI) for Mongolia provides the most up-to-date monthly assessment of economic activity in the country. It is derived from an average of the Business Confidence, Market Growth, Product Sales, Prices Charged and Staffing Indexes. An index above 50 indicates growth, while an index below 50 indicates contraction. November' reading stood at 34.1, down from 36.1 in October, signalling the sharpest deterioration in business conditions since March. The SMI has now been in contraction territory for the past twenty-one months, with the latest decline reflecting all five of its components. Surveyed companies remained pessimistic about their prospects for economic growth in the coming months, with panellists commenting on challenging demand conditions, credit problems, and falling commodity prices. The Business Confidence Index fell to 31.0 from 34.8 in October, the weakest level since February. Panellists also indicated that cold weather conditions are expected to have a further negative effect on the future business climate. The Market Growth Index, which reflects growth of the general marketplace in panellists' own industry sectors, fell at the quickest rate since March during November, signalling worsening market conditions across the country. Moreover, the Product Sales Index, which represents sales made by panellists' own companies, registered the weakest pace in eight months, with panel members attributing this to the falling demand environment. Furthermore, latest data pointed to a strong and accelerated decline in prices charged in Mongolia, with the Prices Charged Index posting 38.2 in November, down from 39.4 in the previous month. According to surveyed managers, the further reduction in prices charged reflected efforts to stimulate client demand, as reports of lower material costs, particularly for oil-related products and metals continued to weigh on companies pricing power. Employment levels decreased further during November thus taking the current sequence of job shedding to nineteen months. The Staffing Index showed the fastest rate of job losses since March and suggested that labour market conditions across the country remained weak. Lower sales and market growth were cited again by panellists to have led to the latest drop in job numbers. "November's SMI data for Mongolia indicated the sharpest deterioration in business activity in nine months. The decline in the headline index was driven by all of its five components. Nonetheless, business confidence, market growth and product sales posted the largest drops, with job levels also declining at a sustained rate. In addition, deflationary pressures continued to intensify as lower commodity prices add to companies pricing power. All in all, the outlook for the reminder of the year remains gloomy as challenging domestic issues suggest that the economy won't be turning a corner soon." November 21 (Bloomberg) Copper's worst rout in seven years will be prolonged by the industry's reluctance to shut major mines, some of which are already unprofitable, according to the world's top miner. The price of the metal has tumbled 27 percent this year as investors fret over faltering Chinese demand and a stronger dollar. Yet major copper suppliers are making only marginal cutbacks to satisfy shareholders, while resisting shuttering operations on the belief they can "tough it out," Codelco Chairman Oscar Landerretche said. "We all have mines that are not profitable at $2.10 and nobody wants to shut down a mine to open it up again because that's extremely costly," he said in an interview Friday from Bloomberg's Santiago offices. "There's this waiting game going on and that makes this adjustment a little bit longer." Copper traded as low as $2.07 a pound Friday, down from about $3 a year ago. Supply and demand factors suggest the metal should be trading between $2.10 and $2.40, while the long-term range is probably $2.80 to $3, Landerretche said. Even so, the market is facing "a couple of years of fluctuation" as demand catches up with supply and investors reduce positions built up during the boom, he said. "What people disagree over is the speed at which this short-term adjustment will occur," said Landerretche, who has a Ph.D. in economics from Massachusetts Institute of Technology. "When Chilean miners go to London this year, they've come back a little more depressed each time." Landerretche said he "suffers" every morning when he checks copper prices. The metal fell to a six-year low in four of the five trading days this week. For now, the effect of the price downturn is most noticeable in the scrap market and among smaller mines. But for the market to tighten, some larger mines will have to close down, he said. Codelco, Chile's state-owned copper miner, is sticking with a strategy of cutting costs, while maintaining annual output of about 1.7 million metric tons. A more than $20 billion investment plan will take output to 2 million tons by 2025 or 2027, Landerretche said. At its smallest and highest cost mine, Salvador, there is plan to make mining operations profitable again next year, as it tries to figure out a "structural problem" at the refinery and smelter, he said. The future of Salvador's processing plants will be decided as part of an analysis of Chile's aging smelting and refinery plants being undertaken by a presidential commission. Codelco's record investment program and cost-cutting drive comes after decades of under-investment and rising costs. The Santiago-based company is working on another savings plan that will be announced next year. "There are going to be new cost-cutting measures, very aggressive ones," to restore the company's status as one of the lowest cost producers, he said. November 18 (Oxford Business Group) With renewed backing from international lenders, Mongolia is moving ahead with plans to broaden its logistics base and improve access to export markets, with a raft of transport infrastructure projects shifting into gear. While a slowdown in the global commodities market is expected to see GDP more than halve from 7.8% in 2014 to 3.5% this year, according to the IMF, Mongolia's drive to boost exports, tourism and trade has kept the funding of key transport projects on track. Rail and aviation projects are seen as particularly pivotal for increasing the country's logistical capacity, with construction firms set to benefit throughout the development stage. Mongolia has pledged to invest heavily in an upgrade of its rail network, which is expected to boost the country's exports – particularly of coal – with China earmarked as the lead recipient. Approval has been secured for construction of a 267-km rail line from the Tavan Tolgoi coal mine, which is being developed in the south of the country, to Gashuun Sukhait on the border with China. The line will allow coal from the mine to be transported directly by rail to markets in China, rather than by truck, achieving significant cost savings. N. Tumurkhuu, minister of roads and transportation, told press earlier this year that logistics account for more than 60% of the per-tonne cost of transporting coal to China. The new direct rail link could reduce logistics costs by as much as 50%, according to local media reports, while also cutting down on pollution and improving the longevity of the road network. A second Tavan Tolgoi rail project could also be in the cards, thanks to Japan's ambitions to challenge Chinese investment in the region. During a recent visit to Mongolia, Japan's prime minister, Shinzo Abe, affirmed that Japan had a key role to play in developing infrastructure in Mongolia and Central Asia to foster greater connectivity. Japan was the country's largest foreign donor in 2013, according to figures from the OECD, accounting for 37% of all assistance received that year. However, this stands in contrast to the most recent export figures, as Japan accounted for just 0.4% of Mongolia's exports last year, compared to the 87.9% that were directed to China. In late October the two countries inked a series of infrastructure deals, including a memorandum of understanding paving the way for Japanese firms to take part in the construction of a second rail line that will help connect Tavan Tolgoi to eastern export markets, such as Japan and the US. The Tavan Tolgoi East Line, which is to be developed separately from the rail link to the Chinese border at Gashuun Sukhait, is expected to run some 1300 km, according to Mongolia's prime minister, Ch. Saikhanbileg, though greater detail about the proposed route of the line – which would likely have to pass through China or Russia – has yet to be released. With estimated reserves in excess of 6bn tonnes, the Tavan Tolgoi mine could prove to be a useful alternative energy source for Japan, which remains mired in a nuclear power debate following the accident at the Fukushima plant in 2011. Japan's new rail project comes on the heels of another investment aimed at expanding Mongolia's aviation capacity. A joint venture between Japan's Mitsubishi Corporation and Chiyoda Corporate are leading the development of Ulaanbaatar's new international airport, while loans from the Japan International Cooperation Agency (JICA), valued at more than $530m, are helping to fund the project. According to the JICA, the loan stands as the largest to be granted by the agency since it began providing support to Mongolia in the late 1970s. Located some 60 km south of Ulaanbaatar, the new airport will have a passenger handling capacity of 3m when it opens in mid-2017, a significant increase over the current facility's capacity. While Chinggis Khaan International Airport, which continues to serve the capital, has increased its passenger handling capacity from 610,000 per year in 2008 to 1.1m in 2013, the facility can no longer keep pace with accelerating demand. The new international airport has been designed with further expansion in mind, with infrastructure to be put in place that will enable the site to scale up to accommodate as many as 12m passengers per year. November 20 (news.mn) The dollar was rated MNT 1800 in this year's budget. The new budget law has changed the dollar rate to MNT 2030. The "Naiman Sharga Currency Center" is currently selling the dollar at MNT 1995, and buying at MNT 1993. 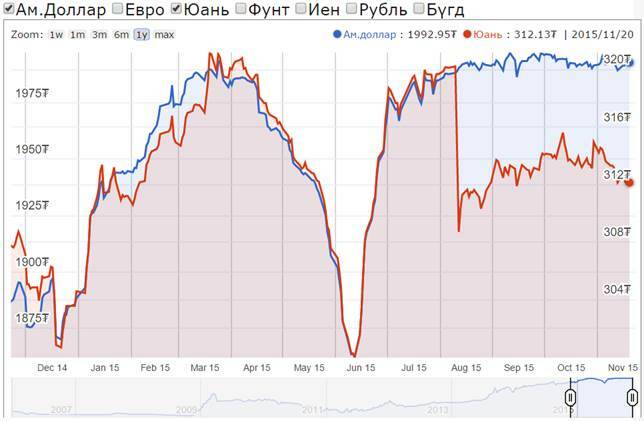 The commercial banks are selling the dollar for MNT 1998, and buying at MNT 1990. Economists are saying that the reduction in foreign direct investment (FDI) and export deposits, the budget deficit of MNT 800 billion are reflected in the high dollar rate. Government officials are assuming that: "If the first investment of Oyu-Tolgoi underground mining, MNT 4.2 billion comes before the end of the year, as is the planned, the dollar rates will be reduced". November 22 (UB Post) The following is an interview with Speaker of Parliament Z.Enkhbold about issues related to the constitution amendment and newly approved state budget 2016. What changes are politicians discussing for the Constitution? I conducted an open poll for 24 hours to see if the public supported or opposed the initiative to amend the Constitution. 57 percent of total 385 people who voted supported the initiative. The constitutional amendment was initiated by the Democratic Party (DP), as well as other party members. The [parliamentary] election will be held next year. We're taking another step for the good of our nation. The draft constitutional amendment includes provisions that should and shouldn't be supported. The DP doesn't have the right to approve all of them as part of the constitutional amendment because at least 57 members of Parliament must approve to pass the amendment. Secondly, members say that the public opinion should be heard before amending the Constitution. Even so, the final decision will be determined by majority votes in the end. The DP is going around to other party members to explain the amendments and appeal to their support. It's illegal to forcibly amend the Constitution according to the Constitution. Amendments that receive votes from more than 51 votes will be passed. Around 20 initiatives were made for three fundamental issues. Parliament is willing to discuss other proposals for constitutional amendments raised by the public. But if they don't, Parliament will only discuss initiatives that have been submitted. In general, some MPs say that we should integrate and discuss issues that have been raised during the past 15 years, since the last constitutional amendment was made in 2000. No one is arguing about one specific thing. That is the provision specifying that the Prime Minister has full authority to appoint cabinet members. There's also the provision enabling direct election of soum mayors. What kinds of criticisms were raised related to the draft constitutional amendment? Some people are critical of a proposal to increase the number of MPs to 99, saying that Mongolia will have too many leaders. 76 members have been representing two million people of Mongolia for 23 years, since 1992. What's changed since then is the power of each MP. We're not trying to just appoint more leaders but to improve the ability to represent. Actually, Mongolia should have around 120 MPs for its population of three million people. However, we're proposing to increase the number of MPs to 99. In fact, the number of MPs should be raised every 20 years. The Parliamentary Office of Mongolia made calculations on this. An addition of merely five billion MNT will be required annually if we have 99 MPs. It's the same amount of funds necessary for the construction of a 20 km road. The public will be able to improve their representation for this cost. In general, Mongolia makes changes to the Constitution once every 20 years or so. The Constitution was first adopted in 1924, and was later amended in 1940 and 1960. A new Constitution was passed in 1992. The new amendment might seem like a major change consisting of all the proposals made in the last 20 years, but it's consistent to three major challenges. Honestly, the three pillars of governance stated in the Mongolian Constitution, namely the executive, legislative, and judicial powers, are currently unstable. Parliament is the supreme body of state power, according to the Constitution. The stability of the three pillars is provided through trilaterally balanced powers. The President is a body unclear to which of the three pillars it belongs. But this has been cleared in 1992, specifying that the President acts as an executive body. A proposal was submitted to elect the President of Mongolia from Parliament. The President is currently elected from the people of Mongolia. It could be said that our nation has a semi-presidential system if the President is elected from the whole population of Mongolia. If we have a presidential system, the President should functions as both the President and Prime Minister, like the USA. But it's not like that. Parliament elects another person for the Prime Minister's position. As this causes some confusion, we should change the Constitution so that Mongolia distributes power correctly, or we'll face difficulties regardless of the person. This is based on lessons from the past. The Mongolian People's Party is saying that there's no more time. Then when will be the right time? A large majority of the public believes that the newly approved budget was designated for the next election. Can you comment on this? As the head of the DP, I know the election will be held next year, but I will not be irresponsible like the previous state, which was ruled by the Mongolian People's Party. We can't ruin the whole nation's economy just to win an election. It can be said that the deficit issued in the draft 2016 state budget, submitted by the government, was approved almost the same. Some principal changes were made. For example, it was specified to minimize operation costs of all state organizations by 10 percent, but Parliament didn't apply this to the wages of teachers, doctors and police officers. The Parliament Office, Office of the President, Cabinet Secretariat, state agencies and provincial administrations will have their operation costs cut by 10 percent. Instead of cutting 10 percent from operation costs, offices can be downsized. Parliament will not downsize. It has 430 staff, but if it downsizes, 43 people will have to be laid off. Rather than losing 43 people, I'd rather lose 10 million MNT that could've been used to initiate laws. The transfer of unnecessary operation costs to the budget for government employee wages has been approved. Overall, the state budget expenditure has been reduced and no new investment projects have been passed. The new state budget has many good qualities. An irresponsible state budget was approved in 2011 because the ruling party at the time didn't have confidence that it would win the election in 2012. This time, the DP will win the upcoming election. No matter what, the state budget will be passed onto us so we have to pass an efficient state budget. Was there a discrepancy on economic growth figures? Discussing the state budget means gathering budget projections. Budget projections are forecasts. It predicts the prices of main export products in the succeeding year. Nobody knows what will happen in the future. One issue was raised during budget discussion: the amount of gold produced by the Oyu Tolgoi mine is expected to decrease again. I've ordered relevant bodies to check this matter. The state budget is developed based on 10 to 20 projections similar to this. Sometimes it's accurate, sometimes it's not. How will the economy change next year? Economists are talking about a "new balance". What is this? People are saying that the whole world is transitioning to a new era. China's two-digit economic growth has slowed down after maintaining it for 20 to 30 years. China is aiming to maintain its economic growth at seven percent and is calling this "the new normal". Mongolia also started a reform for a new, balanced and stable economic growth. We've projected to decrease inflation to 3.4 percent by the end of 2015. Mongolia had a target to drop inflation rate to a one digit number for 25 years, and finally, it's happening for the first time this year. This is guiding Mongolia to a new balance. Frankly, foreign investment into Oyu Tolgoi has finished. Mongolia has only one sector that can attract foreign investment – mining. Other sectors don't have the ability to absorb capital. People invest in mining when prices of raw materials from mining are high. Investors prioritize profit. No one will invest in mining when raw material prices are low. There are many countries dependent on the mining sector besides Mongolia. They are facing much worse situations at the moment. Hundreds and thousands of miners have lost their jobs. Some countries' currency rate has fallen by 30, 40 and even 50 percent. Mongolia has exited its bubble and landed on soil. Balance of payment and monetary loss used to equal 27 percent of GDP, but now it's improved to six percent. We're able to decrease loan interest rates with this achievement. Some economists say Mongolia has finally learned to approve a proper state budget. Do you agree? You must understand that deducting excessive costs of the state budget isn't easy. Costs of the Mongolian National Broadcaster were cut by 50 percent last year, so people think it's possible to do the same this year. However, the livelihoods of many people are behind this budget cut. Expenses can't be reduced by however much we would like it to. Mongolia over spent the last time it made large revenue as it wasn't used to it and didn't know how to systematically spend it. When there's not much revenue, we face difficulties trying to decrease our spending. Next year's state budget deficit has been approved at 3.4 percent [of GDP]. This will be maintained for sure. The state budget deficit will be eliminated in 2017 as Mongolia is reserving resources for repaying its debts. The Minister of Finance submitted a plan to balance revenue and expenditure. It has already been approved by Parliament. As the saying goes, "we will cut our coat according to our cloth", at the cost of 0.1 percent deficit. Ulaanbaatar, November 20 (MONTSAME) Head of the Cabinet Secretariat for Government S.Bayartsogt Friday submitted to the Speaker Z.Enkhbold a draft law on ratifying a general credit agreement on soft loan of one billion USD to be given from China. The general credit agreement on the loan between the government of Mongolia and the Export-Import Bank of China was signed by L.Purevsuren, Mongolia's Minister of Foreign Affairs on November 10. It has been based on a note of the cabinet meeting on October 30 of 2015, proposals and conclusions of the parliamentary Standing committees on economy, on budget and on security and foreign policy. Mogi: on behalf of Cover Mongolia and myself, I extend my deepest condolences to her family and colleagues. She was one of my most favorite journalists, if not the most. She wrote every day against corruption and the corrupt. November 22 (UB Post) Founder and Editor-in-Chief of Mongolian Mining Journal Bolormaa Luntan was found dead in her apartment on November 21. Her passing is a great loss for Mongolian journalism. The reasons for her death remain unknown. "We don't know if her death was linked to outside factors. It's early to start talking about the causes. The forensic results will be available in two weeks," said B.Baatarkhuu, the press agent for the Police Department. Bolormaa wrote mainly about economics, politics, business, and mining. She was named Mongolia's Journalist of the Year in 2003. After graduating from the National University of Mongolia in journalism, she advanced her career at the International Institute for Journalism in Germany and the World Press Institute in the U.S. with a focus on economic and business reporting. She later gained more experience at The Washington Post and Grand Forks Herald. L.Bolormaa started her career in 1998 at Unuudur, as head of the economy and business section. She was then promoted to deputy director to the editor-in-chief of Unuudur from 2001 to 2008. She was a pioneer in bringing Western-style journalism to Mongolia. She published "Daashinztai Survaljlaguud" (Dressed Reports) in 2007, a guidebook for journalism students, teachers, reporters, and editors. The book recounted her journey, from her early days as a reporter, interviews with former United Nations Secretary-General Kofi Annan, and her reports from Afghanistan. In 2013, Bolormaa published her second book, "Zavgui" (Busy), about modern journalism management. Bolormaa founded the Mongolian Mining Journal (MMJ) in 2008. The MMJ is published in English and Mongolian and is an independent news outlet that was named the Best Journal in Mongolia in 2008, 2012, and 2013. She used MMJ as a model to sculpt professional journalism in Mongolia. She also founded the NGO Khugjliin Tuluu Setguulzui (Journalism for Development), aimed at training young journalists in economic and mining reporting. She established Khugjil TV studio in 2011 and broadcast a program frequently aired on Eagle, Channel 25, and C1 TV. She spoke about issues which sparked debate and action, and she was a great champion and role model for independent journalism. Rest in peace, Bolormaa Luntan. Ulaanbaatar, November 20 (MONTSAME) At its plenary meeting on Friday, the parliamentary session considered as necessity to discuss a draft law on running a referendum on where to amend the Constitution of Mongolia. The bill was submitted by N.Batbayar MP on this November 6. N.Enkhbold said it is necessary to discuss every clause of the amendment that aims to ensure sustainable operations of the government, to form a legal environment for implementing state policies and to choose local authorities regardless of political parties. A group, working on the Constitution's amendment, wants to run the national referendum together with the 2016 parliamentary election "because the current parliament will not be able to carry out it within its term". A majority of MPs backed the bill, therefore it has been passed to the Standing committee on state structure for the first discussion. The "Additional Changes to the Electoral Law" presented by the Minister of the Nutrition and Agriculture, R.Burmaa were accepted to be discussed with the 86% votes. The "Additional Changes to the Electoral Law" presented by the Member of tha Parliament Su.Batbold were accepted to be discussed with the 92% votes. The "Additional Changes to the Electoral Law" presented by the Member of the Parliament O.Baasankhuu were accepted to be discussed with the 58% votes. The "Additional Changes to the Electoral Law" presented by the Member of the Parliament H.Temuujin were accepted to be discussed with the 90% votes. November 16 (Daily Mail) This horrifying footage shows the shocking moment a trade union leader in Mongolia sets himself alight to protest against the proposed sale of the country's coal mining industry to China. The unnamed trade unionist had called for a press conference in which he and others told the media about the appalling problems faced by miners in Mongolia. He poured liquid on his suit before setting himself alight as the startled press pack reacted with horror to the unfolding drama. There were screams as his fellow union members ripped off their jackets and immediately started beating the flames from the man lying in agony on the floor. After a terrifying minute, the blaze was finally put out with a fire extinguisher. Amid the chaos, some members of the press snatched their microphones from the stand while others remained to record the shocking incident. The man suffered serious burns and was rushed to hospital. He is currently in a critical condition. The union leader was protesting about the treatment of miners working for Erdenes Tavan Tolgoi, which has 39 coal mines in Mongolia. Unionists fear the sale to China could bring make things even worse as the Chinese could bring in their own staff to operate the mines. Mongolia, the landlocked country between China and Russia, is considering the sale of stakes in ten state-owned companies - including part of its £4bn Tavan Tolgoi mine - as it tries to shore up investor support for its flagging economy. The Mongolian currency, the tugrik, has slumped 35 percent over the past 24 months, while foreign-direct investment fell from $4.5 billion in 2012 to $382 million last year. November 20 (news.mn) The "Erdenes Tavan Tolgoi Company" has taken the decision to transfer their 200 employees who work at the "Zuun Tsankh" mine, to the Chinese company "TTJVCo". At the end of last week, the director of the "Ev Sanaanii Negdel" trade union at "Erdenes Tavan Tolgoi" set himself on fire during a press conference, as a protest on the company decision. Today other members of the trade union met with the "Mongolian Trade Union" (MTU), and took the decision to co-operate. As part of the agreement, the MTU has formed a working group to support the 200 employees of "Erdenes Tavan Tolgoi". The working group will provide legal support and, if necessary, an attorney. Ulaanbaatar, November 20 (MONTSAME) Head of the Cabinet Secretariat for Government S.Bayartsogt and his Deputy G.Ganbold Friday carried out the "Responsibility, monitoring and implementation" monthly online meeting with authorities of Ministries and agencies. Some obligations were given to the Ministries' and agencies' leaders in connection with performance of budgetary revenues and winter preparations. Chair of the Department of Monitoring and Domestic Audit Kh.Oyuntsetseg gave a report about realization of the law on "glass" account and relevant laws, while a division head on macro-economy policy at the Finance Ministry informed them about implementation of a programme on measures for overcoming current economic difficulties. S.Bayartsogt said the authorities of agencies and Ministries should improve a realization of legal documents and a working out of necessary governmental rules in due times. He also told them to give reports to the cabinet on a course of working out rules for implementing laws passed in 2015. November 18 (Devex) Cash transfer programs — giving money to eligible people, including the poor in low-income countries — continue to be a popular poverty alleviation initiative in the developing world today, reaching almost 1 billion people in the past 15 years. Some 24 countries in Latin America, Africa and Asia remain wedded to the idea of empowering the poor through capital infusion as a viable way to achieve sustainable and inclusive growth. However, cash transfer programs in developing nations largely remain means tested — while citizens from some developed countries, particularly those in Scandinavia and other European member states, enjoy a more universal form of capital dole out. But "cradle to grave" welfare systems cost huge amounts of money and necessitate a large amount of available cash to hand out — liquidity that is very often beyond the reach of many low- to middle-income nations. So is it possible for a developing nation to employ a universal cash transfer program? Looking at the evolution of Mongolia's child money program from a targeted to a universal one in just a decade suggests that it is possible. The landlocked North Asian nation has become the first developing country to implement a universal child grant program, following years of difficulties during the implementation phase, due to political, economic and social conditions. "The cash program was implemented by the government to push population growth and it is counted as an investment to the child," Munkhzul Lkhagvasuren, director of Mongolia's population development and social protection ministry, said during a webinar attended by Devex. "It followed some complaints from the households and created some problems." Some of the challenges faced included the design of the program, where the money will come from, eligibility requirements and whether the people in need of the most help actually receive it, and the kind of social welfare that the cash handout should focus on, among others. Lkhagvasuren shared that during the transition from a targeted to a universal system, the coverage of the country's child grant program increased from 35 percent in 2005 to 95 percent currently, while the disbursed amount rose from $2.60 to almost $15 a month for each child. While the targeted program — applied to households with three or more children, and living below the poverty line — revealed an increase in children's social welfare score since its introduction in 2005, issues of leakage to ineligible households represented some 55.9 percent of handouts, while exclusion of poor households was as high as 10.4 percent of all recipients. The Mongolian official shared that while the introduction of a universal cash transfer system had almost eliminated the exclusion issue that the targeted program had, it also increased the leakage issue — with estimates suggesting this has risen to 80.2 percent. So the question now reads: should all countries — developed or developing — follow a universal cash transfer program, particularly for children? Opinions remain polarized on the issue. Some multilateral institutions, including the World Bank and the Asian Development Bank, argue for the need to target the poorest of the poor in an increasingly cash-strapped development finance landscape. Other intergovernmental groups like UNICEF, meanwhile, reason that a universal approach to child money programs "should be adopted" because it effectively resolves the exclusion issue to "reduce the child poverty headcount." "Universal programs are in fact much more effective in reaching vulnerable children in poverty than targeted programs," said Bjorn Gelders, senior social policy specialist of United Kingdom-based consultancy firm Development Pathways, adding that the program could work in principle if every component including policy, fiscal space, economic growth, and strong implementation are in place. The specialist explained that in the case of Mongolia, there is strong political will on the part of the government. It was this, he said, that enabled the child money program to transition from a targeted to a universal initiative and continue sustainably. The number of inhabitants in the country also played a role in the rollout. As compared with 100 million people in the Philippines or 1 billion in India, Mongolia's population is relatively very small at around 3 million people, with the youth representing 35.1 percent of the total population. Also to be taken into account was the fact that the country's economy is growing rapidly, with growth peaking in 2004 at 10 percent on the back of revenues rolling in from its booming extractives industry valued at over $1 trillion. These revenues were tapped by the government to finance the program, according Luca Beard in a Leadership Academy for Developmentreport. All these elements will have to be borne in mind if other developing countries follow Mongolia's pioneering step towards a universal child support grant. What can developing nations do to introduce a more universal cash transfer system to promote development? What can be done to avoid the issue of leakage and exclusion to make these types of programs more efficient? November 19 (OHCHR) The Committee on the Elimination of Racial Discrimination will hold its eighty-eighth session at the Palais Wilson in Geneva from 23 November to 11 December to review anti-discrimination efforts undertaken by the Holy See, Lithuania, Egypt, Slovenia, Mongolia and Turkey. At the opening meeting, the Committee will hear from a representative of the Office of the High Commissioner for Human Rights and adopt its agenda. During the session, the Committee will hold informal meetings with non-governmental organizations that will brief the Committee on the situation in the countries whose reports it will consider. It will also continue to review its working methods. The Committee will consider communications that have been submitted to it under article 14 of the Convention. In addition, it will discuss follow-up activities to the Durban Declaration and Programme of Action adopted at the World Conference against Racism, Racial Discrimination, Xenophobia and Related Intolerance, and to the Durban Review Conference. The public sessions run from 10 a.m. to 1 p.m. and 3 p.m. to 6 p.m. Live webcasts can be viewed at www.treatybodywebcast.org. Mongolia is presenting its combined nineteenth to twenty-second periodic report CERD/C/MNG/19-22, while the last concluding observations and recommendations by the Committee, on the eighteenth periodic report of Mongolia, considered in August 2006, can be read in CERD/C/MNG/CO/18. The concluding observations and recommendations on the reports that are reviewed will be published at the above link on Friday, 11 December. The Committee will hold a news conference at 1:30 p.m. on Friday, 11 December at the Palais des Nations in Geneva to discuss its findings. Ulaanbaatar, November 20 (MONTSAME) On the sidelines of his official visit to the Republic of France, the President Ts.Elbegdorj received Thursday the Director-General of the World Organization for Animal Health Dr Bernard Vallat. The latter noted that Mongolia is one of the important partners of the organization, which has 180 member-countries, and thanked the President for his time. In response, Ts.Elbegdorj extended thanks to the World Organization for Animal Health for assisting Mongolia during the outbreaks of foot-and-mouth disease in 2014 and 2015. Dr Vallat said he will visit Mongolia soon in connection with Mongolian parliament's having run a first reading of a bill on Animal and Livestock Health. Then, the sides exchanged opinions on preventing and ceasing a spread of animal epidemic diseases such as foot-and-mouth disease and brucellosis. The World Organization for Animal Health sounded a request to organize the next international conference on pastoral livestock farming in Mongolia. Mr Elbegdorj accepted it proposing a date--the first week of September of 2016 in Ulaanbaatar, under his auspices. The EBRD is considering providing a loan of up to EUR 12 million to the City of Ulaanbaatar (the City) on-lent to Ulaanbaatar Water and Wastewater Authority (the Company), a municipally-owned water utility, to finance the expansion of wastewater treatment services in the City. It is expected that an international financial organisation would also provide co-financing with a loan of up to EUR 10 million. Additionally, the EBRD will seek an investment grant from an international donor of EUR 2 million to complete the financing package for the project. The proceeds of the loans and the grant will financethe construction of wastewater treatment plants and network systems in a new industrial development area of Ulaanbaatar City. · Tariff reform: Tariff increases for water and wastewater services are covenanted. The Company will calibrate the tariff methodology and its implementation. · Commercialisation: The Project will have a positive demonstration effect in Mongolia through commercialisation by providing TC for the Corporate Development and Stakeholder Participation Programme. · New and replicable product: The Project will have a positive demonstration effect in Mongolia, as this would be the first investment project in Mongolia on sub-sovereign basis. · Increased environmental standard: The Project will reduce health risks for the City population and prevent environmental pollution in accordance with the EU standard. · Increased transparency: The Project is expected to bring improved standards of transparency and governance. November 20 (news.mn) A month has passed since the City Tax was launched on 1st October. During this period 5374 entities have charged 1% for 4 kinds of services and two kinds of products. According to the legislation, the tax must be transferred to the City Tax Authority on 10th of every month. We have inquired regarding the taxation process by the various entities and the accumulated revenue. As of 12th November, MNT 110 million has been paid. November 20 (UB Post) The Clean Air Fund will be shut down to reduce government spending. The government has not allocated funds for combating air pollution in the 2016 state budget, according to N.Bataa, the vice director in charge of economic and financial issues at the Ulaanbaatar Mayor's Office. The Clean Air Fund was the initiator of the Clean Stove Project. Approximately 87 percent of the air pollution in Ulaanbaatar is caused by coal burning stoves in ger districts. "The government doesn't understand the impact of the liquidation of the Clean Air Fund," said air quality researchers, against the government's decision. According to a 2014 study by the Clean Air Fund, Mongolia loses approximately 38,000 disability-adjusted life years (DALYs) annually due to air pollution. DALY is used to calculate the capital that a nation loses due to wealth creators becoming incapable of work. By 2024, the nation's annual lost DALYs will rise to 54,500. Currently, the Mongolian air quality index is already seven to eight times higher than the World Health Organization standard. November 20 (news.mn) On 18th November, Prime Minister Ch.Saikhanbileg was introduced to the newly-completed transit hall and new aircraft parking facility at the airport. Because of the increased space, the airport which used to have the capacity of 800 passengers per hour, can now take 1200 passengers. The Prime Minister was shown the new passport control area consisting of eight channels and the newly launched "E Gate". Mr Saikhanbileg expressed his appreciation to the heads of the Ministry of Transportation, the General Civil Aviation Authority, Chinggis Khaan International Airport, and the national carrier MIAT for undertaking the modernization work within such a short period. It should be noted that the construction works have not been financed by the State Budget, but with MNT 1.9 billion investment provided by Chinggis Khaan International Airport itself. November 20 (news.mn) From 19th-24th, the Mayor of Ulaanbaatar, Mr E.Bat-Uul, is making an official visit to North Korea November, at the invitation of the Mayor of Pyongyang. The mayor is being accompanied by Deputy Mayor of Ecological Affairs, T.Bat-Erdene, Deputy Mayor of Transportation and Infrastructure S.Ganbaatar, the Director of the Foreign Affairs Bureau at the City Administration D.Narantsetseg, City Administration Media Bureau representative, B.Dulamsuren, Director of the Project and Co-operation department, D.Otgonbaatar and Director of the City Administration Cultural Department, B.Battsengel. The delegation also includes Secondary Secretary at the Asia-Middle East-Africa Bureau at the Ministry of Foreign Affairs, B.Jamsran. During the visit, two sides will discuss the central purifying system and other ecological issues. November 22 (UB Post) Unofficial waste collection sites in residential areas in Sukhbaatar District were shut down during the city's winter preparation program. Waste management companies were ordered by the General Manager of Ulaanbaatar to clear the dump sites. Altan Dornyn Khuch Company cleared the waste collection site south of Secondary School No. 11 in the fifth khoroo of Sukhbaatar District. Ulaanbaatar Shinechlel Company is working to clear the ninth khoroo. Tsuzuki Yume Company has cleared and rehabilitated a waste collection site in 16th khoroo, and Sukhbaatar Devshil Company has cleared five dump sites and rehabilitated them, according to the Mayor's Office. November 18 (The Diplomat) In the joint statement issued last week during the final day of Mongolian President Tsakhiagiin Elbegdorj's three-day visit to China, the China-Mongolia relationship is touted as being the "best ever" in history. China-Mongolia relations have indeed grown more intimate in recent years. Just last year China upgraded its relationship with Mongolia from a mere "strategic partnership" to a "comprehensive strategic partnership," which covers security and political cooperation. It's no secret that Mongolia is heavily dependent on China. According to 2015 data from Trading Economics, China accounts for 89 percent of Mongolia's exports and 26 percent of its imports. The slowdown of the Chinese economy in fact affected the Mongolian economy so badly that the government has considered bureaucrat employment and salary cuts and sales of company shares in state-owned sectors like postal service and energy. In the words of founder and director of the research firm Independent Mongolian Metal & Mining Research Dale Choi, "when China sneezes, [Mongolia] gets a cold". Perhaps most tellingly of the relationship, Mongolia cancelled a visit by the Dalai Lama last year in favor of a visit by Chinese President Xi Jinping, a move sources claim was the result of pressure from China. But while Mongolian and Chinese leaders and businessmen may be taking all possible steps to not antagonize each other, the story is more complex from the perspective of their citizens. As Mongolians celebrate the 25th anniversary of their democracy this year, some fear that the country is selling out to China, and, despite repeated Chinese proclamations that Mongolian sovereignty will be respected, that China will eventually take over their territory. Even more prevalent is the idea that rather than a political or military takeover, China will overwhelm the country with its economic activities. According to University of British Columbia Ph.D. candidate Mendee Jargalsaikhan, anti-Chinese sentiment stems from negative schemas constructed during the era of Sino-Soviet tensions when Mongolia was under the Soviet influence. Despite the warming in official relations, anti-Chinese attitudes continue to circulate in Mongolia's blogosphere and public discourses, partly because there is still reluctance within official circles to actively dismantle residual anti-Chinese sentiment. Jargalsaikhan argues that the Mongol attitude toward the Chinese is also part of a "global anti-Chinese phenomenon" rooted in power imbalances, backlash against Chinese economic activities, and conflicts over identity issues. In his new book Sinophobia: Anxiety, Violence, and the Making of the Mongolian Identity, University of Cambridge researcher Franck Bille explains that "anti-Chinese attitudes of Mongols reflect an essential desire to distance themselves from Asia overall and to reject their own Asianness." It's not difficult to spot signs of anti-Chinese sentiment even in modern-day Ulaanbaatar. Graffiti calling for the removal of the Chinese sprinkle urban settings, urban legends about poisoned Chinese goods drum up paranoia, and locals, insistent on enforcing social norms that maintain the "purity" of Mongol blood, excoriate Mongol women who become intimate with Chinese men. One rapper, Gee, has become popular in the capital performing songs featuring anti-Chinese slurs and calls to stand up for the Mongolian national identity. Extremist neo-Nazi groups like Tsagaan Khass and Dayar Mongol place their main targets on the Chinese and are still active as of this year. While the prejudice is concentrated largely in older populations and probably not as pronounced in daily life as extremist groups would like, it's clear that President Elbegdorj's claim that "China enjoys popular support among the Mongolian people" does not hold up. The Chinese are not oblivious to the Mongol stance. Questions like "How do Mongolians see China?" or "Why do Mongolians hate China?" circulate the Chinese blogosphere, and spark critical reflection of the Chinese exacerbation of the relationship from netizens. But given Mongolia's relatively much weaker geopolitical pull and historical positioning, anti-Mongol sentiment in China is not nearly as pronounced in the few areas where it exists. That is not to say that there are no entrenched and consequential suspicions. In July this year, the Chinese police arrested 20 foreign tourists in Inner Mongolia reportedly because they were watching a documentary on Genghis Khan deemed to be "propaganda." As with all relationships mired in historical tensions, it will take time for a high-level warming of relations to filter into the general populace. And there isn't a lack of hope. Every year hundreds of Mongolians study abroad in China, and with both governments promising increased people-to-people exchange, the younger generation seems better poised to escape the historical traps of their predecessors. November 17 (PanARMENIAN.Net) - Minister of Integration and Macroeconomics of the Eurasian Economic Commission, Tatyana Valovaya hailed the cooperation between the EEU and Mongolia on the sidelines of the November 12-13 working visit to the country. At the meeting with Mongolian officials, Valovaya said: "Half a year has passed since our first meeting and the signing of a memorandum on the formation of a joint working group, testifying to our mutual interest in developing cooperation." Together with the Mongolian Minister of Industry Dondogdorj Erdenebat, Valovaya held the first meeting of the Working Group for Cooperation between the EEC and the Government of Mongolia. The Mongolian officials reaffirmed the country's interest in enhancing trade and economic cooperation with the EEU states, increasing exports of traditional Mongolian goods to the Union members, also dwelling upon the problems with the export of local products to the EEU market. The Eurasian Economic Commission, in turn, expressed willingness to promote within their competence the development of trade and economic cooperation between Mongolia and the EEU, carefully examine the proposals of the Mongolian colleagues on the development of such cooperation. The Eurasian Economic Union is an economic union of states located primarily in northern Eurasia. A treaty aiming for the establishment of the EEU was signed on May 29, 2014 by the leaders of Belarus, Kazakhstan and Russia, and came into force on January 1, 2015. Treaties aiming for Armenia and Kyrgyzstan's accession to the Eurasian Economic Union were signed on October 9, 2014 and December 23, 2014, respectively. Armenia and Kyrgyzstan's accession treaties came into force on January 2, 2015 and August 6, 2015. The head of Russia's Eastern Military District press service said that Russian-Mongolian Selenga-2016 military exercises will take place in Russia's Republic of Buryatia. KHABAROVSK, November 17 (Sputnik) – The Russian-Mongolian Selenga-2016 military exercises will take place in Russia's Republic of Buryatia, the head of Russia's Eastern Military District press service said Tuesday. According to Gordeev, both Russia and Mongolia sent 850 troops to take part in Selenga-2015 exercise held on August 19-27 in Russia's Zabaikalsky Territory. November 17 (China Daily) Closer cooperation between Chinese and Mongolian companies on infrastructure projects will boost bilateral ties between the two nations and also with Russia, officials said. China, Russia and Mongolia recently announced the construction of a trilateral economic corridor to boost political, trade and cultural exchanges among the three nations. Close on the heels of the announcement, work has already started on the ground. China State Construction Engineering Corporation, the third largest construction company in the world, is already in discussions with a State-owned Mongolian railway enterprise to build the eastern railroad in Mongolia, according to Li Jiqin, managing director of the company's overseas businesses. The economic corridor will have three north-to-south railway lines, while the existing western line that runs through the three nations, and delivers mining resources, will remain unchanged for the time being. The central line will be updated with the required construction standards for Chinese railways, said Li. CSCEC has participated in the upgrading work for the central railroad, in addition to the construction of the eastern line. "We are doing the planning and design work for the central line and expect to complete the same within a year," he said. "It is possible that private firms from China will participate in these projects as there are many flexible modes for financing." Li, however, declined to release the actual investment on these projects. However, he said the company's revenue from overseas markets has been growing at 20 percent in the past few years. "We started participating in overseas projects since the 1950s and have already gained considerable experiences. The Belt and Road Initiative is a further step in our efforts for qualitative growth," he said. He said the company will help build several roads in the southern part of Mongolia to link with the northern regions of China. The roads, Li said, will help facilitate trade between the two neighbors. The economic corridor linking China, Mongolia and Russia was proposed by Chinese President Xi Jinping last year during a meeting with Russian President Vladimir Putin and Mongolian President Tsakhiagiin Elbegdorj on the sidelines of the 14th summit of the Shanghai Cooperation Organization. During the China-Mongolia Expo held in Hohhot, Inner Mongolia autonomous region in late October this year, vice prime minister of Mongolia Ts Oyonbaatar said China's foreign policies have given Mongolia great opportunities for investment. At the same time, the increasing power demand and rich agricultural and mining resources in Mongolia are also offering several business opportunities to Chinese investors, he said. "Mongolia will treat domestic and foreign investors equally to boost economic growth," he said. Up to 46 projects with total contracts value of nearly 57 billion yuan ($8.96 billion) concerning energy, petrochemical, equipment manufacturing, construction, logistics and tourism were signed between Chinese and Mongolian companies during the expo. Ulaanbaatar, November 20 (MONTSAME) On November 19, the President of Mongolia Tsakhiagiin Elbegdorj and the President of the Republic of France Francois Hollande made a joint statement, concluding the Mongolian leader's official visit to France. They noted that this visit was special for coinciding with the 50 anniversary of diplomatic relations between the two countries. The two dignitaries expressed interests to deepen the bilateral friendly relations and cooperation on the basis of the concept of 1966's Intergovernmental Agreement on Friendly Relations and Cooperation. The two Presidents reassured that the ties between Mongolia and France will strengthen in accordance with the shared objectives, such as promoting sustainable development with cherishing of human rights and democracy, protecting global peace and stability, supporting multilateral talks, non-proliferation of mass destructive weapons (MDW), combating terrorism, and safeguarding the ecological and cultural diversity. In regard to the 21st session of Conference of Parties (COP) of the United Nations Climate Change Conference, which will run in Paris in fortnight, the Presidents highlighted the importance of an agreement on limiting the global warming within +2 Celsius compared with the climate condition of the pre-industrialization years. The French leader underlined that the Republic of France attaches a significance to developing of ties with Mongolia, the special partner in Asia. France shows active support for Mongolia's democratic ways and prioritizes good governance and rule of law in the cooperation with Mongolia, noted the French side. Mr Hollande appreciated Mongolia's decision to abolish death penalty, and supported intended internal legal changes regarding this issue of Mongolia. The Republic of France compliments Mongolia's commitments to ensuring of a security in Northeast Asia and also its willingness to take active part in the UN Peacekeeping Operations. The French side expressed its acknowledgement of Mongolian President's initiative on neutrality, which aims to strengthen the country's freedom, independence and sovereignty. The Mongolian President reaffirmed Mongolia's aspiration to upgrade the relations with France in a notion that France, a permanent member of the UN Security Council and one of the founders of the European Union, is a "Third neighbor" of Mongolia. The Mongolian side confirmed that the Republic of France is a capable partner to introduce to Mongolia the necessary know-how and capacity. Promoting cooperation with the diversity of French industries will facilitate possibilities for intensifying the bilateral commercial, economic and technical exchanges. It is unquestionable that Mongolia's aspiration to formulate a development model--with French legal system and norms as examples and is complementary to Mongolia's geographic features, and to prepare qualified lawyers will open new opportunities of the cooperation. The two Presidents agreed to put more efforts in intensifying cooperation in politics, security, defense, economy, energy, agriculture, the environment, health, culture, education, sciences and sports. The heads of the two states expressed a mutual satisfaction with the signing of vital documents during this visit. The Presidents agreed on deepening political and economic ties through Mongolia-France political consultations and intergovernmental working group on Economic Cooperation. The visit of the French Prime Minister to Mongolia, to be paid in 2016, will give an impetus to implementing the agreed cooperation and will facilitate the upgrading of the bilateral relations. Mongolia appreciates the series of soft loans and assistances of the Government of France for implementations of development projects in healthcare, communication, water treatment and the environment protection, said the President of Mongolia. The heads of the two states agreed to maintain good cooperation in agricultural and environmental spheres. They also emphasized the active involvements of French companies in developments of Mongolia's major energy projects, and agreed to promote public and private partnerships in frames of the energy sector renovation. The French side applauded the initiative to establish a Center for Mongolian Studies in order to promote Mongol studies in France. The Mongolian side promised a full support for Alliance Française activities. The two Presidents agreed to study possibilities of increasing a quota of scholarships given to Mongolian students to study in French universities. They also decided to continue the Mongolia-France archaeological cooperation. The sides agreed to collaborate in consolidating defense cooperation, particularly in capacity building of the Mongolian peacekeepers. The two Presidents pledged the cooperation in the renovation of the UN Security Council. Mongolia confirmed its support to France's proposal, put to permanent members of the United Nations Security Council, on refraining from exercising their veto in cases of mass atrocities and genocide. The sides expressed a mutual satisfaction with the recent achievement in the two countries' inter-parliamentary cooperation, and underlined the importance of further deepening of such ties. The Presidents of the two countries reaffirmed a significance of cooperation between Mongolia and the European Union. The sides complimented the signing of the Agreement on Partnership and Cooperation in 2013, which has allowed further strengthening of Mongolia-EU relations. The President of the Republic of France congratulated Mongolia on its decision to host the 2016 ASEM Summit and confirmed that it will cooperate and support in the organization. Ulaanbaatar, November 20 (MONTSAME) For significant contributions to the Mongolia-France relations and cooperation, some French citizens have been awarded state prizes of Mongolia on occasion of the 50th anniversary bilateral diplomatic relations. A ceremony of granting the state prizes ran Thursday during the official visit of the Mongolian President Ts.Elbegdorj to France. Pursuant to a decree of the President, the Polar Star Order went to Erik Masse, a member of the Rubruck cuty-based France-Mongolia friendship society, and to Negr Jacques, a hospital manager in Orleans city. The "Friendship" medal went to others from the Rubruck city's France-Mongolia Friendship Society, a NGO and cultural society. November 20 (news.mn) On 16th November, the Speaker of Parliament, Z.Enkhbold received the Polish Ambassador, Mr Michael Labenda. The Ambassador has thanked the Speaker for making time and provided information about the Polish elections. During the meeting, the two sides exchanged their views about Mongolian – Polish political, economic and mining relations. The Speaker noted that the two countries have worked successfully together for many years in educational cooperation and expressed his thanks to the Polish Government for enabling Mongolian students to receive an education in Poland. Also, the Speaker has proposed to show support to the "Mongol Studies Faculty" at the Warsaw University, which is the biggest "Mongolian Study Center" in Europe. November 20 (gogo.mn) The 19th meeting of ASEM Venue and Accommodation working group led by P.Tsagaan, Chief of Staff of the Office of the President of Mongolia, was held on November 18. The meeting had on its agenda the soft loan to be furnished to the hotels during the summit, the concession agreement of the Ikh Tenger Government complex, follow up on the tasks of the working group's previous meeting and policies and guidelines to be pursued in the days and months ahead. During this period, service staff of hotels that would be accommodating delegates to the ASEM summit have been included in a series of English training and on-the-job re-training sessions, and the shooting of the training sessions have by TV5 for the production of a serial distance learning TV programs. According to a memorandum of understanding signed with the Ministry of Labor, relevant agencies have been requested to submit their proposals for the development of training programs under the Employment Promotion Fund. Although 150 billion MNT soft loan was earmarked for more than 40 hotels that have been selected to host the guests and delegates to the ASEM summit, its implementation is dragging on and accordingly the head of the working group P.Tsagaan has instructed the relevant responsible agencies and organizations to expedite the process. According to the Mongolian National Construction Association, 40 percent of the blue print of the Ikh Tenger complex has been completed and since a concession agreement would be concluded upon its completion, it has been decided that the funding of the project would be finalized shortly. The meeting has decided that all ASEM-partner hotels would set up souvenir shops and they would also sell handicrafts made by physically challenged people. It has decided also to organize competitions and training among Mongolian chefs designed to improve their professional skills, and also to develop a comprehensive menu of Mongolian national dishes, and a service standard to be applied at partner hotels as well as ASEM Villa township. November 20 (gogo.mn) At today's plenary session, the parliament discussed the draft law of joining The European Convention on Extradition. The government submitted the draft law to the parliament on October 20. Mongolia currently has treaty on the extradition with eight countries, and swapped its prisoners with Russia, China, Korea and Czech. Despite making request to establish the extradition treaty with USA, Japan and Switzerland, it has not been materialized yet. However, if our country joins the European Convention on Extradition, it will be step forward to establish the treaty with more countries , said Minister of Justice Mr. D.Dorligjav. MPs today mentioned that it is necessary to join the convention in order to swap Mongolian citizens in detention with European countries where Mongolian people travel to or work in a large number. As the discussion summarized, 80.5 percent of MPs supported joining the convention. November 22 (UB Post) Jennifer Zimdahl Galt, the new U.S. Ambassador to Mongolia, gave remarks about the U.S. Embassy's plans to enhance commercial relationships between the two countries during a welcome reception hosted by the American Chamber of Commerce in Mongolia (AmCham). AmCham organized the reception for Ambassador Galt, the newly sworn-in U.S Ambassador to Mongolia, on November 19 at the Wagner Asia Automotive Showroom. The Ambassador touched on three main goals that she hoped to accomplish during her time in office: to bring the transparency agreement (TA) between the U.S. and Mongolia into force; to support Phase 2 underground mining at Oyu Tolgoi; and to help diversify the Mongolian economy by increasing U.S. and Mongolian business partnerships. She noted the importance of the bilateral TA being brought to force to improve the business and investment climate in Mongolia. "The TA will not come into force until Mongolia brings its laws into compliance. We are nearly there, but we have been nearly there for a quite a while now. We never seem to get all the way there," Galt said, and urged AmCham members to talk to their contacts in the government about the significance and "urgency" of the issue. Ambassador Galt said that the Mongolian investment and legal environment lacks consistency and clarity, referencing the trial and imprisonment of three foreign mining executives earlier this year. "[Investors] fear that Mongolia's courts and prosecutors will not fully observe principles of due process and that foreign investors will be coerced into settling legal disputes on disadvantageous terms," Galt said. The Ambassador stated that travel bans remain a concern, leaving investors reluctant to conduct business in Mongolia. Talking about her recent visit to the OT underground mine, the Ambassador stated, "the real wealth coming out of the ground at OT is the hundreds of skilled Mongolian workers at the site." She believes that the project will increase capital flow, and although those benefits might not seem significant for the next few years, it will bring about much-needed investment and development to Mongolia. Galt's third goal was to diversify the Mongolian economy, noting the importance of a focused approach. She spoke of AmCham's role in Mongolia's rise to success, as the organization works to support the government in creating a stable business environment, drive investment, improve business standards, and encourage market competitiveness. Ambassador Galt specified that as Mongolia has "native advantages" in agriculture and animal husbandry, the government should underwrite the necessary infrastructure and a legal framework to support the development of the agricultural industry in partnership with the private sector and organizations such as AmCham. Initiatives will focus on entrepreneurship, pedagogy, and urban planning. November 20 (MIT) MIT has announced plans to launch a pilot program in Mongolia that will include initiatives in faculty development, urban planning, and entrepreneurship. Institute President L. Rafael Reif and Gantumur Luvsannyam, the Mongolian minister for education, culture, and science, signed the agreement Wednesday morning at MIT. President Reif expressed his gratitude to Minister Luvsannyam for supporting the program and added: "We are delighted to work with Mongolia on a range of bottom-up activities which will set the basis for larger collaborative projects." "We are very pleased to be able to launch this new pilot program," said Richard Lester, associate provost for international activities at MIT, whose office spearheaded the effort. "The program grows out of a series of careful discussions with our Mongolian partners, and we are confident that it will have an impact on the ground in Mongolia while also offering exciting opportunities to MIT students and faculty for learning and research." "Mongolia is a nation with great pride in its history and heritage. The nation is now at a turning point of grand vision by leveraging science and technology across various business verticals to make this vision a reality," Luvsannyam said. "Partnering with MIT is a historical milestone to enable us as a nation to achieve our mission and create an innovation ecosystem." The program includes a number of activities planned for the upcoming year, some geared toward faculty and professionals and others toward students and youth. These activities will be coordinated in Mongolia by Enkhmunkh Zurgaanjin '09 — the first Mongolian citizen to attend MIT. "As a graduate of MIT, it is my honor to be part of the MIT Mongolia program," said Zurgaanjin. Stephen Graves, professor of management and mechanical engineering, is the MIT faculty lead for the initiative. "The collaboration will start with a limited set of activities around mutual interests, with an emphasis on entrepreneurship-related activities; we will also do some sharing of pedagogical practices and some exploratory efforts focused on urban issues, as is very relevant for Mongolia," Graves said. "The intent largely is to build relationships and get to know each other, setting the stage for a longer-term collaboration." The program includes a plan for staff from MIT's Teaching and Learning Laboratory to travel to Mongolia and conduct workshops open to faculty from Mongolian universities and colleges, as well as an opportunity for a faculty member from Mongolia to spend a semester at MIT. A "Mongolia Urbanism Workshop" held at MIT will welcome up to 10 experts in urban planning from Mongolia, with the goal of identifying areas for collaboration in the future. Through the Regional Entrepreneurship Acceleration Program (REAP), a team of MIT students and a faculty members will travel to Mongolia for two months to undertake a mapping of the entrepreneurial landscape of Mongolia and to recommend steps to strengthen the entrepreneurial environment. Separately, student teams with Global Startup Labs will travel to Mongolia for six to eight weeks to teach mobile app development and to support student entrepreneurs from Mongolian universities in incubating new and innovative technologies. "Mongolia is a fascinating country," says Bernd Widdig, MIT director for international activities, who was part of an assessment team traveling to Mongolia in 2014. "There are great opportunities for research and for connecting our students with this young and dynamic democratic society that greatly values education and technological innovation to solve their challenges." Ulaanbaatar, November 20 (MONTSAME) An irregular meeting of the cabinet on Thursday decided that the Law School at Mongolia's State University (MSU) is to be named after a famous lawyer late B.Chimed. After graduating from the Law School in 1966, B.Chimid served as a teacher and department manager of the school, the Minister of Court, the Chairman of the Supreme Court of Mongolia, a division head of the Presidium of the People's Great Khural, the secretary of the State Congress and a member of parliament in 1992-1996. All his 60-year work in the spheres of defense, education, court, legislative and executive bodies B.Chimed devoted to scientific works and experiences. He was also one of the co-authors of the new Constitution of Mongolia; he worked on formulating vital documents of laws and politics. November 20 (gogo.mn) Secondary school of #2 named after General D.Sukhbaatar has completed the construction of the extension. Being completed with the financing from Ulaanbaatar Administration, the extension will accommodate 800 more students of 22 classes at the school. Previously, four schools and kindergartens in Sukhbaatar District also completed the extensions at their complexes. The opening ceremony of new building will take place at 12 pm today. November 20 (news.mn) The Control and Prevention Center for Autism has conducted a study which has concluded that one in every 68 children is autistic. The number of boys with autism is five times higher than girls. If it is true that 0.62% of the population has autism, this means that there might be as many as 18,000 people with the condition in Mongolia. Unfortunately, there is a lack of general information and a shortage of expert staff and people trained in diagnosis Therefore, the "Autism Mongolia - AND" foundation has started a campaign named "Together with Autistic Children", within the framework of which awareness and support works will be conducted among the population. "Together with Autistic Children" will continue until 15th May 2016. November 20 (gogo.mn) Mother and Child Health Center now opens newly refurbished treatment room, which is able to provide intensive treatment for infants with up-to-date technology facilities and convenient environment, meeting international standards. Initially starting its operation in 1987, the department of MCHC had 75 beds for healthy infants and 17 beds for early born babies in two rooms. Only routine maintenance has been made in the rooms of the department until today. As of last year, the department provided treatment for 11260 infants and 1530 early born babies. November 20 (news.mn) Research carried out by the Mongolian Ministry of the Health and Sport and the World Health Organization (WHO), show that 54% of all adults, 14% of the children under the age of five and 12% of all teenagers are overweight. The WHO study reveals that 30% of overweight people started to gain weight in childhood. The WHO is struggling actively fighting obesity. WHO representative, professor Barrie Margetts has adviced that: "Children buy unhealthy junk foods from shops close to their schools. Therefore, the changes should start from here. This is essential to change the nutrition habits before they get older. In other words, state policy is required to struggle with child obesity". Mogi: ummmm, get over yourself? November 20 (UB Post) At 1:30 a.m. on Sunday morning [November 8], I and my Mongolian co-workers arrived back in Ulaanbaatar after a working visit to Umungovi. As we were exiting the bus, we were aggressively accosted by about six half-drunk "taxi drivers". They were almost fighting with each other, and at one point one of them even grabbed my suitcase. Clearly, what had excited them was the possibility of money from the "rich" foreigner. I have been living in Mongolia for many years, and I have seen many things here that I would not care to write about, but even I was shocked at the gratuitous and childish behavior of these men. I love this country: its culture, its nature, its history, and its people. My many Mongolian friends can bear witness to that fact. But it saddens me that for so many people, foreigners are just seen as walking ATMs, to be used and abused because we are seen to be rich. This is disturbing, not least of all because political leaders and opinion makers appear to do nothing to challenge this attitude. In fact, some seem to encourage it. That is more damaging to Mongolia's culture than anything else that I can think of. In fact, it is an issue of Mongolia's national security. Yet, ironically, very few of us foreigners have anything like the concentrated wealth that the political and economic elite here seems to control. Many Mongolians are well aware of this concentration of wealth by the elite, so the temptation to distract attention on to others is easy to understand, especially with an election coming. And, of course, it is easy to scapegoat foreigners because they are different. It is much harder to take the higher road of leadership and governance that this country so desperately needs. I believe, therefore, that it would be enormously beneficial for Mongolia – as well as for the many foreigners who are here for the good of this country – if the people who lead us could spend less effort filling their own pockets while scapegoating others, and more effort addressing the genuine problems of the nation they are called to serve. November 18 (World Religion News) An ancient tradition for some Mongolian and Tibetan High Buddhist Lamas of the past was to construct enormous statues of Maitreya Buddha. Maitreya is the Buddha, or Bodhisattva of Loving – Kindness, the root word for Maitreya in Sanskrit literally means 'loving kindness.' It is taught that Maitreya is the embodiment of all of the Buddha's and bodhisattva's Loving – Kindness for all sentient beings. Currently the Grand Maitreya Project is working to help further re-build the Buddhist culture that was once so prevalent in Mongolia. At the projects core will be the world's largest symbol of Loving – Kindness, a 177 foot tall statue of the standing Maitreya Bodhisattva. Connected to the statue will be a 354 foot tall stupa with several interior levels. Enshrined inside of the statue and stupa will be holy relics of the historical Buddha. November 20 (news.mn) Under the recently approved "Amnesty Law", 2071 prisoners have been freed. To date, 1558 of them have reported officially to the police, to confirm that they have returned home. The Ministry of Labor has informed that they will provide job positions. As of 16th November, 300 of the ex-prisoners who have filled out job application, at their local labor office. A total of 100 people are ready to work immediately. The Ministry of Labor has started to provide advice about to work and in which field, profession and under what salaries, during a series of private consultancy meetings. November 20 (news.mn) Under the 2013 "Cigarette Control Law", smoking cigarettes in public places is banned. In the meantime a total of 1441 people who have been caught smoking in public places and three commercial organisations which have let people smoke have been fined to the tune of MNT 74 million. Even though, it is claimed the law is being implemented 80%, the real situation is totally different. For example, some 600 kiosks are selling cigarettes secretly and the requirement not to smoke within 500 meters of schools and kindergartens is not being implemented. The police, inspection personnel and every level of the administration has the right to penalize anyone who breaks the law. The fine as set out in the "Cigarette Control Law" is MNT 50,000 for anyone caught smoking in public place and on the street. SALT LAKE CITY, November 20 (Deseret News) — Sitting on a makeshift bed under a tarp with a local Primary president whose home burned down in Phnom Penh, Cambodia, two weeks ago, was a tender and beautiful experience for Sister Cheryl A. Esplin, first counselor in the LDS Church's Primary general presidency. "We gathered her little family around and we sang 'I Am a Child of God,'" Sister Esplin said in an article posted Friday on mormonnewsroom.org. "And they believe that with all their heart. They have faith, and they don't let the hardships of life keep them away from their faith and what they believe. It was a beautiful experience." Sister Esplin and Sister Neill F. Marriott, second counselor in the Young Women general presidency, visited Hong Kong, Cambodia and Mongolia earlier this month to visit with children, young women, women leaders and missionaries of The Church of Jesus Christ of Latter-day Saints. They also made home visits, which included visiting families living in gers in Mongolia. The women auxiliary leaders also visited a former landfill known as "trash mountain" where Cambodians once scavenged for food. The LDS Church has partnered there with the Cambodian Children's Fund to provide support. The newsroom article said LDS Charities has provided dental and hygiene equipment and sewing machines in recent years, and earlier this year it built 40 homes in the area as part of an initiative to help families learn skills and become more self-reliant. November 22 (UB Post) It is said that success is ultimately measured by what you have done for others rather than for yourself. In this sense, how successful are Mongolians? What are we doing for others without being asked to? How are we volunteering? How many people have you helped without thinking of your own personal interests and not asking something in return? Helping others means that you would lend a hand to another person regardless of where you are and how you can assist, and without expecting them to do anything for you. Volunteerism, with roots in the Latin word "velle" meaning "helping others", among the people indicates how culturally advanced a country is. The word "volunteering" was first introduced in 1755, when people who lived in Europe voluntarily signed up for the army. The usage of the word spread when people used the word to describe any activity that helped the soldiers: sewing uniforms, cooking, and treating the wounded. The women who helped the army were called "volunteers". Volunteerism started to take place in an organized manner by the beginning of the 20th century, when well-known organizations such as Rotary International, Lions Club International, and the Salvation Army were founded. WHY DO WE HAVE TO VOLUNTEER? The United Nations says that volunteering is the main source of strength and humanitarianism amongst communities all over the world. If people combined their efforts and joined powers, it would be less difficult to overcome the challenges faced by an entire nation. Winston Churchill, a former British Prime Minister, once said "We make a living by what we do, but we make a life by what we give." We need to be generous with each other and volunteer to contribute to resolving the issues faced by not only our country, but also the world. We should not wait for others, such as the government, NGOs, and international organizations, to resolve the issues that we come across on our path to development. When solving such problems, we need to utilize our own resources, help each other, and join efforts. No one promises pay, forces or pushes someone to volunteer to do something. When people volunteer, the job they are doing is mostly very efficient because it is done from their heart and with passion. Volunteers are usually happier and more satisfied than whoever is receiving their help. The hard work, time, knowledge, skills, and generosity dedicated by volunteers also makes a great contribution to economy. For instance, nearly 70 million people (almost one in every four) volunteered 7.7 billion hours, which is estimated to be worth 171 billion USD, in the United States in 2013. It is calculated that the total value generated from volunteering equals almost three percent of GDP in developed countries and 0.8 percent in developing countries. In this era where information and communications technology have come so far, it is easier than ever to volunteer for an activity. Wikipedia, an online encyclopedia, is a great example. The website was operated by only one person in 2005. However, thanks to the volunteers who contribute online, Wikipedia has been named one of the top 50 websites in the world – even ranked ahead of the New York Times. I came across an American volunteer in Arvaikheer soum in Arkhangai Province almost ten years ago. He was carrying a cauldron and his clothes were covered with ash. I could not help but wonder how we, the Mongolians, help each other, in comparison to an American who had willingly left his comfortable life and travelled thousands of miles to come to the countryside of Mongolia and teach English. During the socialist era, people were forced to volunteer. When the socio-economic transition happened, such mobilization ceased to exist, which resulted in a significant reduction in volunteering. Nevertheless, volunteering has been revived in the last few years and is seeing much richer content. The younger people who have studied abroad in developed countries are leading the volunteering today. The Mongolian Association of State Alumni, a U.S. alumni organization abbreviated as MASA, initiated the website bidchadna.mn, which allows people living with disabilities in Ulaanbaatar to connect with employers and find jobs near their residential areas. Furthermore, MASA started a project named Right Decision – Bright Future to help high school students choose their profession on an informed basis by producing video lessons and organizing a series of training for social workers at high schools. Alumni networks in other countries are doing a lot of volunteering as well. Mongolians say, "If others reach their objectives, your objective will be achieved as well." Volunteerism plays an important role in a country with a population as small as Mongolia. The simplest example is students working voluntarily at an organization. Although the basic requirement to apply for a job is previous experience, students have a hard time finding a part time job. There could be a website that connects volunteer students with jobs in their field of interest. We could build a culture where university students can use volunteering hours for credits, and organizations first ask whether the applicants have done volunteer work when conducting job interviews. It is time to set up a system where volunteers are mobilized in the event of an emergency, such as natural disasters, infectious disease outbreaks, and forest fires. There needs to be a legal framework that allows volunteers to be organized, trained, valued, and supported. We need to launch initiatives that encourage and promote the people who volunteer and the work they have done. Volunteerism becomes the basis of a humanitarian society. When the culture of helping others is built, it effects the mentality of people, who then view volunteering as a responsibility. In such a country, national unity is strengthened and development becomes human-centered. My fellow Mongolians, let us join our efforts in volunteering to develop our beautiful country! November 23 (GoGo Mongolia) State Secretary of Ministry of Energy Mr. D.Delgertsogt and other representatives participated in sub-committee's meeting of "Scaling Up Renewable Energy in Low income countries Program" or "SREP" held in Washington DC by Climate Investment Funds. At the meeting, the delegates discussed the 2015-second half report of SREP and investment plan of Mongolia, Uganda Bangladesh. Mr. D.Delgertsogt highlighted at the meeting: "Mongolia developed the investment program according to the requirements of the program, and is working on improving legal environment regarding the issue. The meeting dedicated to the energy sector will be held during ASEM 11th SUMMIT, as the country set the objective to supply energy to north-eastern Asian countries by developing renewable energy." SREP made the decision to grant US 30 million to the Government of Mongolia in order to support the implementation of Mongolia's renewable energy investment program, after Mr. Angarag introduced the country's plan in energy sector at the meeting. The $796 million Scaling Up Renewable Energy in Low Income Countries Program (SREP) is a funding window of the $8.1 billion Climate Investment Funds. It was established to scale up the deployment of renewable energy solutions in the world's poorest countries to increase energy access and economic opportunities. Ulaanbaatar, November 20 (MONTSAME) A ceremony took place on Friday at the "Puma Imperial" hotel to open the "Sustainable management for forest and for improving livelihood of local people" and "Strategy and management on saving peat-bog" projects. Opening remarks were made by N.Battsereg, the Minister of Environment, Green Development and Tourism, by Minori Kikuchi, a Counselor of Japan's Embassy in Mongolia, and by Robert Schoellhammer, the Permanent Representative of the Asian Development Bank (ADB) to Mongolia. Mr Battsereg said Mongolia can collaborate with the project on forest sustainable management by introducing techniques and technologies in Mongolia and producing goods from felled trees, while Mr Kikuchi underlined an importance of focusing on a protection of environment in times of Mongolian market development. The two projects aim to save environment of Mongolia, he added. These projects are to be implemented as a result of efforts of the Ministry of Environment, Green Development and Tourism, Mr Schoellhammer said. A developing of a strategy on saving peat-bog "will be helpful in the pasture animal husbandry", he noted and underlined a significance of participation of the project team, local people and co-operatives in the project. The "Strategy and management on saving peat-bog" project is expected to be realized until the end of 2016, whereas the "Sustainable management for forest and improving livelihood of local people" project will be implemented within two years. November 23 (GoGo Mongolia) Today snow storm to hit the Western region, warned by the Hydrometeorological and Environmental Monitoring Agency. Changeable clouds at Central and Gobi regions. Increased clouds at other regions. Snow and mild snow storm are expected at Eastern parts of Western region, Western parts of Central region, Southern parts of Eastern region. Winds from SE in Gobi region, NW in other regions reaching 6-11 m/s. Temperature at Darhad hollow will reach -23 to -28C, -19 to -24C in Ider, Tes, Orhon, Selenge, Haraa, Yuruu, Tuul, Terelj, Herlen, Onon river basins, -4 to -9C in Gobi of Altais, -11 to -16C in Western region and Southern parts of Gobi region while -15 to -20C in other regions. ULAANBAATAR CITY: Decreased clouds and no snow. Winds from NW reaching 5-10 m. Temperature will reach -16 to -18C. November 21 ((MMAWeekly.com) Marat Gafurov and Narantungalag Jadambaa went to war in Beijing on Saturday night local time in a back-and-forth fight, which pushed both men to their absolute limits. In the end, it was the Russian who prevailed to unify the ONE Championship featherweight titles with a rear-naked choke late in the fourth round. Their title unification bout was the headline attraction of ONE: Dynasty of Champions in the National Olympic Sports Centre Gymnasium. After an evenly matched opening round, Gafurov scored a takedown attempt early in the second stanza and quickly locked on an armbar. The fight seemed all but finished with the tap from Jadambaa a matter of formality, but the Mongolian showed unbelievable heart, not to mention impressive flexibility, to somehow survive and escape. Despite the setback, Gafurov was still in top position, where he proceeded to punish the regular champion. Gafurov was able to move fluidly from side control to half guard to mount to knee on belly to crucifix position, while constantly punishing the face of his prone opponent with punches and elbows. Yet Jadambaa not only survived, he worked his way back to his feet and finished the round with a barrage of punches. The undefeated Russian looked to be the more fatigued of the two going into the third round, but capitalized on an ambitious flying knee attempt to take Jadambaa down. Gafurov took the Mongolian's back and sunk in one of his trademark submission attempts, but once again the 39-year-old somehow survived, worked his way back up, and then landed some hard punches of his own. Jadambaa started the fourth round in confident style, stuffing a couple of takedowns and landing punches to the body and head. A wild attempt at an overhand right left him off balance and Gafurov capitalized ruthlessly to drag him to the ground and once again moved from mount to side control to crucifix position, while landing a barrage of punches. Jadamba gave up his back in a desperate attempt to escape and Gafurov locked in another rear naked choke. The brave Mongolian refused to tap and had to be rescued by referee Olivier Coste, who recognized he had slipped into unconsciousness and called the bout off with 21 seconds remaining in the round. At the end of an action packed title fight, which will be talked about for years to come, Gafurov succeeded in unifying the titles and remains undefeated, moving to 13-0. Jadambaa drops to 10-4 after suffering the first submission loss of his 11 year professional career. The new ONE Championship 125-pound titleholder is also undefeated, as Kairat Akhmetov literally wrestled the belt away from Adriano Moraes. The Kazakh prevailed courtesy of a split decision after repeatedly taking the defending champion down, although he was never able to capitalize with either ground and pound or submission attempts. The only scare for Akhmetov came at the end of round five, when he took Moraes down only for the Brazilian to reverse the position and start to posture up and throw down punches. It was probably the most significant single moment of the fight, but it was not enough for the defending champion to erode the lead his opponent had already amassed on the scorecards. Moraes can count himself a little unfortunate to find himself on the wrong end of a split decision for the second time in his career. His record drops to 13-2, while Akhmetov has yet to taste defeat and improves to 23-0, claiming the ONE Championship flyweight title in the process. In welterweight action, Nikolay Aleksakhin (16-3) dominated Burenzorig Batmunkh (302) for the best part of three rounds, scoring a rear naked choke win with 21 seconds remaining in the fight. Jeff Huang (6-2) needed just 90 seconds to win his rematch with Trestle Tan (3-5-0-1) by TKO. There was also a one-night, four-man featherweight tournament, which saw teammates Yang Sen (2-0) and Zhang Jia Cai (1-1) clash in the final. The former prevailed courtesy of a Kimura early in the second round. FUKUOKA, November 21 (Kyodo) – Yokozuna Hakuho was surprisingly beaten for the second successive day as Harumafuji grabbed sole possession of the lead at the Kyushu Grand Sumo Tournament on Saturday. On the penultimate day of the year's final meet, Hakuho (12-2), who suffered his first defeat here at the hands of Harumafuji a day earlier, was ushered out to a painful second loss by ozeki Terunofuji (8-6), while Harumafuji (13-1) closed in on his first title in two years with victory over Kakuryu (8-6). Hakuho, seeing his 36th championship start to slip away, struggled from the start of a contest that lasted almost three minutes, allowing his opponent to get the better grip of the belt. The two were at a standstill in the center of the ring for most of the bout before Terunofuji made the move, backing the winningest rikishi of all time beyond the straw bales. Hakuho now must defeat fellow yokozuna Kakuryu — who he owns 36-4 for his career — on Sunday and hope ozeki Kisenosato upsets Harumafuji, who breezed past Kakuryu on Saturday at Fukuoka Kokusai Center. Kakuryu lost his footing from the tachiai and Harumafuji took full advantage, spinning his man around and shoving him out of the circle to send the yokozuna to an embarrassing sixth defeat. Harumafuji is 32-21 lifetime against Kisenosato, who improved to 9-5 by default after ozeki Kotoshogiku (8-6) withdrew with injury. November 20 (news.mn) "Miss World 2015" is to be held from 21st November to 20th December in the Chinese city of Sanya. Mongolia is participating in "Miss World" for the 11th time since 2005. The national winner of the selection competition, "Miss World Mongolia 2015", which was held this summer, was N.Anu. She also won "Miss World Mongolia 2013". N.Anu will, therefore, be Mongolia's candidate in Sanya. "Miss World" has been held in Sanya four times previously, namely -2003, 2005, 2007, and 2010. Crossing frozen lakes and mountain passes, the nomadic Kazakhs of western Mongolia make an epic journey with their livestock every spring - Timothy Allen joined Shohan's family in February.